The school near us wouldn’t enroll him … why wouldn’t they let us go to school? Everyone is entitled to nine years of compulsory education, right? —Mother of Chen Yufei, Henan Province, January 2013. The mother of Chen Yufei tried hard to find a school for her son, a nine-year-old boy with attention-deficit/hyperactivity disorder (ADHD) and an intellectual disability. When Chen was 7 she brought him to a nearby school, but the principal would not let him enroll because he would “affect other children.” Reluctant, Chen’s mother turned to special education schools, but she could not find one: the district in which they live did not have one. Eventually she got Chen accepted in a special education school in another district — after two years and a hefty bribe. She still bitterly resents this experience, as she believes her son would make much better progress if he were in a mainstream school. Across China, children and young people with disabilities confront discrimination in schools. This report documents how mainstream schools deny many such children admission, ask them to leave, or fail to provide appropriate classroom accommodations to help them overcome barriers related to their disabilities. While children with mild disabilities are in mainstream schools where they continue to face challenges, children with more serious disabilities are excluded from the mainstream education system, and a significant number of those interviewed by Human Rights Watch receive no education at all. By ratifying the CRPD in 2008, the Chinese government made a commitment to “the goal of full inclusion.” Yet it has no clear and consistent strategy to achieve that goal. It continues to devote too few resources to the education of students with disabilities in mainstream schools while at the same time actively developing a parallel system of segregated special education schools. Inclusive education is not just a legal obligation, and it benefits not only students with disabilities — a system that meets the diverse needs of all students benefits all learners and is a means to achieve high-quality education and more inclusive society. While an inclusive education system cannot be achieved overnight, the Chinese government’s current policies and practices raise questions about the extent of its commitment to do so. The Chinese government has taken important steps to promote the rights of people with disabilities. Internationally, it was supportive of the development and adoption of the CRPD. Domestically, it passed the Law on the Protection of Persons with Disabilities (LPDP), which outlines the rights of people with disabilities as well as a number of regulations on disability. It has pledged greater funding for the education of people with disabilities and has taken steps such as waiving miscellaneous school fees to facilitate their access to education. However, a closer look at education for people with disabilities reveals a grimmer picture. According to official statistics, over 40 percent of people with disabilities are illiterate and 15 million live on less than one dollar a day in the countryside. The Chinese government has an impressive record in providing primary education for children without disabilities, achieving near-universal compulsory education for such children. But according to official statistics, the rate for children with disabilities is much lower: about 28 percent of such children should be receiving compulsory basic education but are not. The Chinese government has often been considered a model in reaching the Millennium Development Goal regarding the provision of primary education to all children — but the picture dramatically changes if the data are disaggregated to focus on enrollment rates for children with disabilities. Bars to enrollment, expulsion from schools, and lack of adequate support in mainstream schools, as well as lack of information about and trouble reaching special education schools, are the main reasons for the enrollment gap. Discrimination against children and young people with disabilities permeates all levels of education in the mainstream system. Schools sometimes deny enrollment outright, but they are often more subtle, convincing the parents to take their children out of the schools with a variety of arguments. Schools sometimes place conditions on parents, such as requiring that they accompany their children to and in school every day, before they allow their children to study in the schools. While Chinese laws and regulations contain provisions prohibiting discrimination on the basis of disability, the provisions are often vague, fail to precisely define discrimination, and do not outline effective redress mechanisms. The Chinese government also does not have a clear policy on “reasonable accommodation” in mainstream schools — defined in the CRPD as “necessary and appropriate modification and adjustments not imposing a disproportionate or undue burden.” In interviews with Human Rights Watch, parents told of carrying their children up and down stairs to classrooms or bathrooms located upstairs several times a day. Students with hearing impairments said they could not follow along because the teachers walk around while teaching and do not to provide written notes, and there is no sign language instruction in most schools. They told us that students who are blind or who have limited vision are not provided with magnified printed materials or tests. Some mainstream schools exclude students with disabilities from the examination system; they do not get graded and their progress is not otherwise evaluated. In some rural areas, the government’s policy of consolidating mainstream schools in recent years has had a negative effect on students with disabilities, as schools to which they are assigned are further away and provide no transportation. While some teachers and principals in mainstream schools make Herculean efforts to provide reasonable accommodation to students with disabilities — out of the “goodness of their hearts,” as one interviewee put it — such support is not institutionalized. In both policy and practice, the mainstream education system is set up in such a way that the teacher’s focus is on students without disabilities; it is the child with a disability who is expected to adapt to the system. Teachers find that the burden of supporting students with disabilities rests entirely on their shoulders, as they are provided with little support to ensure reasonable accommodations in the classrooms. There is no staff support to assist the teachers, who often have to teach large classes of 30 to 60 students. Training for teachers and administrators in mainstream schools is limited and little funding goes to ensure that such schools are adequately resourced to educate these students. There is also little incentive for teachers to provide support to students with disabilities because doing so does not impact their performance ratings or prospects for promotion. As a result, many students with disabilities literally find themselves sitting in classrooms without being able to follow the curriculum. This leads to failing performance and declining confidence, which only reinforces the effects of existing discrimination. China calls its scheme for students in the mainstream education system “study along with the class”; because of the obstacles such children face, it has come to be jokingly referred to as “sit along with the class” or “muddle along with the class.” A large percentage of students with disabilities eventually drop out of school or move to special education schools. Once in the special education system, there is little hope of their being able to cross back to the mainstream school system. Families with children with disabilities should have a choice in selecting the most appropriate educational settings for their children, but currently do not have a meaningful choice. In China, special education schools have fulfilled an important function in providing access to education for children with disabilities, and they are generally well-resourced with both teachers and equipment. However, special education schools separate children with disabilities from those without, which in many cases is not what the children or their parents want. Special education schools are fewer in number and typically farther away than mainstream schools and parents often know little about them, deterring parents from sending their children to them. And they often require the removal of children from their families and communities and placement in a residential institution from a young age. Moreover, many students with severe disabilities are excluded even from special education schools. Children with disabilities rarely stay in school beyond junior middle school, and for those who aspire to do so, choices are limited. The Chinese government maintains a system of physical examinations for secondary school students who wish to enter mainstream institutions of higher education. During this process, people with disabilities are required to declare their disabilities, and the results of the medical exams are sent directly to the universities. The government also has guidelines advising higher education institutions to bar or restrict access to students with what they refer to as certain physical and mental “defects.” In addition, students who are blind have very limited access to mainstream universities, as the government fails to readily provide Braille or electronic versions of the gaokao, the university entrance exam. While there are vocational schools for people with disabilities as well as higher education institutions in the special education system, they tend to focus on training for skills and professions that are traditionally reserved for people with disabilities. For example, the blind are trained in massage therapy and the hearing impaired are trained in visual arts. Students with disabilities who aspire to other professions face daunting challenges. This includes the education profession itself: bureaus of education typically prohibit the hiring of teachers with certain disabilities. Parents play a pivotal role in determining whether a child with disabilities is brought to school and whether the child can overcome the barriers in the system. However, many parents interviewed by Human Rights Watch lacked essential information about their children’s educational rights and options. While almost all of the children we interviewed had disability cards issued by the China Disabled Persons’ Federation (CDPF), a quasi-governmental disability body, the CDPF has not effectively reached out to parents about their children’s education, let alone helped them identify and remove barriers in mainstream schools. The CDPF and the Ministry of Education, which oversees education, also fail to proactively address discrimination and ensure that reasonable accommodation is provided in mainstream schools. Human Rights Watch calls on the Chinese government to make an explicit commitment towards a truly inclusive education system by revising existing laws and regulations and by drawing up a clear strategic plan towards such a goal. The government should formulate a policy of reasonable accommodation consistent with international law, set up a mechanism to monitor and provide effective redress in cases of discrimination, and develop outreach programs to support parents so that they are informed of their children’s rights and education options. Failure to ensure access to inclusive and quality education is not only a violation of human rights, but also increases burden on families and incurs economic, social, and welfare costs. Revise the Regulations on the Education of People with Disabilities to bring them in line with the Convention on the Rights of People with Disabilities. Specifically, the new regulations should state clearly that the Chinese government’s overarching goal in the education of people with disabilities is full inclusion at all levels of education and set forth specific actions authorities should take to ensure reasonable accommodation of students with disabilities in mainstream schools. Develop a time-bound, strategic plan to move towards an inclusive education system that delivers quality education, with specific indicators to measure access to education for children with disabilities. Immediately repeal the Guidelines for the Physical Examination of Students in Recruitment for Ordinary Higher Level Educational Institutions because they allow disability-based discrimination in higher education. Develop guidelines for the effective evaluation of students with disabilities studying in mainstream schools and ensure that their educational progress is reflected in the performance assessment of their teachers and schools. Provide financial and other resources, including adequately trained staff, to mainstream schools so that they can ensure the provision of reasonable accommodation to pupils and students with disabilities. Establish an independent body made up of independent disability experts and representatives of children with disabilities and their parents to monitor the school system’s compliance with relevant laws and regulations and to receive complaints about discrimination and lack of reasonable accommodation at mainstream schools. The body should be charged with making recommendations for reform. Detailed recommendations can be found at the end of this report. This report is based on 62 interviews conducted in 12 provinces in China between December 2012 and May 2013. Forty-seven of those interviews were with children and young people with disabilities or their parents. Of the 47, 38 were under age 18 (“children,” as defined in international law) and 9 were over age 18; 12 were out of school (6 had never been to school while six had dropped out) while 35 were in school (18 in mainstream schools and 17 in special education schools). We interviewed 30 of the 47 in the presence of their parents or grandparents. The rest of our 62 interviews were advocates for people with disabilities, educators, government officials, and academics. All of the children and young people we interviewed were or should have been in school after the Chinese government’s 2008 ratification of the CRPD. Human Rights Watch interviewed children and young people with a range of disabilities, including physical, sensory (hearing and visual), speech, intellectual, and mental disabilities. Some of the interviewees had multiple disabilities. Almost all of them had disability cards issued by China Disabled Persons’ Federation (CDPF). These cards, which use the classifications prescribed in Chinese law, identify the holders as having the following disabilities: visual, hearing, speech, physical, intellectual, mental, multiple disabilities, and “other.”  Parents used these categories when describing their children’s disabilities, but some pointed out that the categories were inaccurate or did not capture the full range of their children’s disabilities. Since Human Rights Watch was not in a position to identify the interviewees’ disabilities, we have used the CDPF classifications in this report. In each interview, Human Rights Watch explained the purpose of the interview, how the interview materials would be used and distributed, and sought the participant’s permission before the discussions started. Interviewees were told that they could terminate the interviews any time they wished, or refuse to answer any questions. All the interviews were conducted in Chinese but some required interpretation from the regional dialect or sign language into Mandarin. Human Rights Watch ensured that when interviewing these children and young people, the way we asked the questions was appropriate for their age and sensitive to their disabilities. No interviewee received financial or other compensation in return for interviewing with us. We were also careful to protect all interviewees’ identities and have replaced their real names with pseudonyms in the report. Because the Chinese government does not allow independent nongovernmental organizations to conduct human rights research in China, it was difficult for Human Rights Watch to obtain interviews with people in their official capacity. We were only able to interview a handful of government officials, academics, and educators and administrators in public schools. Despite these restrictions, we believe the findings of this report are nationally representative as our interviewees were drawn from 12 Chinese provinces and our analysis is based on national laws and regulations. For the report, Human Rights Watch also consulted a number of international disability experts. We also reviewed relevant English- and Chinese-language domestic and international press reports, official documents, UN documents, NGO reports, and academic articles. Our findings are generally consistent with those set forth in these other sources. According to official Chinese sources, an estimated 83 million people in China — 6.3 percent of the population — have disabilities. This is far below the global disability prevalence rate estimated by the World Bank in 2011, which is 15 percent, and is likely an underestimate. If the World Bank prevalence rate is used, the number is 200 million. As is often the case in other countries, people with disabilities in China are the country’s “largest minority.” In China, over 40 percent of people with disabilities are illiterate and 15 million live under one dollar a day in the countryside, according to official figures. The largest group is people with physical disabilities, with a population of 25 million, followed by those with hearing, multiple, visual, mental, intellectual, and speech disabilities. There is currently no data on those with autism. The government reports that 75 percent of people with disabilities live in rural areas. The Chinese government has presented itself as a champion of people with disabilities both domestically and internationally. It passed the LPDP in 1990 and issued administrative regulations including the Regulations on the Education of People with Disabilities (REPD) in 1994; these protect the rights to education, employment, and accessible environments for people with disabilities. Internationally, the Chinese government has supported major events concerning people with disabilities, notably including the first international NGO summit on disability held in Beijing in 2000. In 1988 the Chinese government established the China Disabled Persons’ Federation (CDPF) under the leadership of Deng Pufang, who has paraplegia and is the son of the late Deng Xiaoping, China’s political leader in the 1980s. According to its constitution, the CDPF aims to “represent, serve and manage” people with disabilities. Although the government often refers to the CDPF as a nongovernmental organization, it acts under the direct supervision of China’s chief administrative authority, the State Council. It has a nationwide network “reaching every part of China” and 80,000 full-time workers, with its headquarters in Beijing. It is responsible for a wide range of matters relating to people with disabilities including education, employment, rehabilitation, culture, sports, advocacy, publications, and residential care. There are four levels of education in China: pre-school, primary education (ages 6 to 12), secondary education (ages 13 to 18, which includes junior middle school, senior middle school, and vocational school), and higher education (ages 19 to 23). The Chinese government’s policy is to guarantee nine years of free compulsory education, including six years of primary and three years of secondary education. A child starts primary school when they are six years old, though in some areas children can begin school when they are seven. The Ministry of Education oversees education at all levels in China from pre-school to universities, as well as vocational training schools and special education schools. It is also responsible for drafting legislation on education, developing curriculum and teaching materials, and training and certifying teachers. The allocation of education funding is uneven in China, particularly at the compulsory education level where local governments are responsible for providing adequate resources. This leads to wide gaps between rural and urban areas and between rich coastal and poor inland regions. The Chinese government currently operates two main systems of education which people with disabilities may attend: mainstream schools and special education schools. In the special education system, students are divided according to type of disability — there are schools for the blind, for the deaf, and for those with intellectual disabilities; some special education schools can accommodate children with multiple types of disabilities. Special education schools started in China in the 1950s soon after the establishment of the People’s Republic of China, providing important access to education for people with disabilities when educational opportunities were otherwise very limited. Schemes for the education of students with disabilities in mainstream schools are called “study along with the class” or “learning in regular class” (LRC). According to Ministry of Education statistics, there were 1,767 special education schools enrolling 398,700 children with disabilities in 2011; that same year mainstream schools provided education to another 225,200 children with disabilities (including via special education classes in mainstream schools). There are also some privately run special education schools or “rehabilitation institutions” that provide education to children with disabilities. As noted above, CDPF statistics show that about 28 percent of children with disabilities in the compulsory education years do not go to school, but this figure is not entirely reliable because official statistics regarding disability and education from different government agencies are conflicting and inconsistent. Considering that nearly all Chinese children in the general population go to school at this stage, a 28 percent non-attendance rate is an astonishing gap. Among those children with disabilities who are out of school, 80 per cent are in rural areas. In its policies and plans for education the Chinese government has outlined various targets to raise the enrollment rate for children with disabilities. The vision is to raise the rate to match that of children without disabilities, and to raise the rate in rural areas to at least 90 percent enrollment by 2015. While official statistics show steady progress in raising the enrollment rate of children with disabilities since 2007, the government is unlikely to meet these targets unless it addresses the problems documented in this report. The Chinese government is party to the Convention on the Rights of the Child (CRC), the International Convention on Economic, Social, and Cultural Rights (ICESCR), and the CRPD. The ICESCR and CRC guarantee everyone the right to education by making primary education compulsory and free, secondary education available and accessible, and higher education accessible on the basis of capacity. The ICESCR also obliges governments to ensure that the material conditions of teaching staff will be continuously improved. States are also obliged to take measures to encourage regular attendance by children at schools and the reduction of child drop-out rates. With respect to children, states are required to undertake such measures to the maximum extent of their available resources. Specifically, children with disabilities should receive and have effective access to education. The CRPD articulates in greater detail the right to education for people with disabilities: they enjoy this right “without discrimination and on the basis of equal opportunity,” they have a right to “an inclusive education system at all levels,” and they have a right to learn skills so that they can participate within their community fully and equally. China’s Compulsory Education Law (CEL) stipulates that “all children” who have reached the age of six must go to school. The LPDP explicitly guarantees the right to education for people with disabilities. The LPDP stipulates that the government’s priorities are to ensure that students with disabilities have access to compulsory education and to develop vocational training, noting that “efforts shall be made” to implement education at pre-school as well as higher education levels. The Regulations on the Education of Persons with Disabilities (REPD) spell out in greater detail how the education of people with disabilities is to be provided at all levels as well as how teachers of people with disabilities are to be certified, trained, and remunerated. In addition to these laws and regulations, the Ministry of Education also issues rules and normative documents on the education of people with disabilities. Finally, the State Council has issued long-term plans that give broad outlines of the education of people with disabilities from pre-school to vocational training and higher education levels and makes commitments to teacher training and subsidizing students with disabilities. International law prohibits discrimination on the basis of disability, which is defined under the CRPD as any “distinction, exclusion or restriction…which has the purpose or effect of impairing or nullifying the recognition, enjoyment or exercise, on an equal basis with others, of all human rights and fundamental freedoms.” In terms of education, the CRPD requires that “people with disabilities are not excluded from the general education system on the basis of disability, and that children with disabilities are not excluded from free and compulsory primary education, or from secondary education, on the basis of disability.” This obligation of non-discrimination applies both to public as well as private actors, and at all levels of education, including higher education and vocational training. The Chinese Constitution proclaims that all Chinese citizens are “equal before the law.” The LPDP also prohibits “discrimination on the basis of disability.” These are statements of principle, however, and neither the Constitution nor the LPDP define discrimination, outline consequences for discrimination, or provide guidance on how to prove discrimination in court. The proposed amendments to the REPD, released by the Ministry of Education in February 2013 for public comment, offer a small improvement in article 48, which spells out a number of consequences for discrimination, including “sanctions” by educational authorities and “apologies and compensation” to the offended party. Such consequences apply only in cases of “obvious discrimination,” but there is no definition of discrimination or details about the kind of discrimination that should be considered “obvious” in the proposed amendments. The CRPD requires states to make education inclusive at all levels. The CRC also stipulates that education of people with disabilities should be conducive to the child’s social inclusion. The Committee on the Rights of the Child, a body of independent experts that monitors treaty implementation and issues general recommendations, has stated that “legislation which compulsorily segregates disabled children in segregated institutions for care, treatment or education” is incompatible with the treaty. Inclusive education should be distinguished from two other approaches to educating people with disabilities. One is segregation, where children with disabilities are placed in educational institutions that are separate from the mainstream education system. Another is integration, where children are placed in mainstream schools as long as they can fit in these schools and meet their demands. Unlike inclusive education, integration tends to regard the disabled child rather than the school as the one who needs to change. Inclusion focuses on identifying and removing the barriers to learning and changing practices in schools to accommodate the diverse learning needs of individual students. In China, there is often confusion over the concepts of “integration” (ronghe) and “inclusion” (quanna) by academics and policy makers and the two terms are often used interchangeably. The affirmation of the right to inclusive education is part of an international shift from a “medical model” of viewing disability to a “social model.” A couple of decades ago, disability was considered a defect that needed to be fixed. Disability today is viewed as an interaction between individuals and their environment, and the emphasis is on identifying and removing discriminatory attitudes and barriers in the environment. While the CRPD advocates “the goal of full inclusion,” it also states that the primary consideration should be the “best interests of the child.”  In some circumstances, such as when an inclusive education system is not yet functional or necessary accommodations cannot be reasonably provided, it may be more effective for the child to be educated in special education settings for part or all of the time. The CRPD emphasizes the voice and choice of children with disabilities. It is important that the government make efforts to ensure mainstream education is inclusive and accessible for children with disabilities, and make special education available so that children with disabilities have meaningful choices. As mentioned above, the Chinese government is currently operating two main parallel systems of education for people with disabilities: special education and mainstream schools. The two streams exist in parallel and rarely interact. For example, the training of teachers in these two systems is separate: teachers are either trained for the special education system or for the mainstream system. The goals for the two education systems are different — while the mainstream system aims to propel students through the educational ladder and into universities, with a strong focus on succeeding in national academic exams, the special education system mostly focuses on getting students through compulsory education and providing vocational training. Although the two systems do overlap in some areas, the facts remain that they are separate and parallel and that there are systematic barriers preventing students with disabilities from entering and staying in the mainstream system. Children with disabilities are entitled to attend mainstream schools only if they are “able to adapt themselves to study in ordinary classes” and can “study along with the class.” This is in essence a form of integrated education — it is the students with disabilities who have to adapt to the education system, not the reverse. In its review of the Chinese government’s compliance with the CRPD in September 2012, the Committee on the Rights of Persons with Disabilities expressed concern about the “high number of special schools and the State party’s policy of actively developing these schools” and recommended that the government “reallocate[s] resources from the special education system to promote … inclusive education in mainstream schools.” So far, the Chinese government has not taken concrete steps to meet this recommendation. The government’s 10-year education plan, issued in July 2010, includes specific targets and clear timelines for building more special education institutions but no comparable targets and timelines for the education of students with disabilities in mainstream schools. And while funding for special education schools has nearly quadrupled in the past decade, funding dedicated to mainstream schools specifically for the education of students with disabilities has seen little growth; most local governments have not dedicated funding to help mainstream schools implement “learning in regular class” (LRC) schemes. The government’s proposed amendments to the REPD continue to call for the building of new special education schools, including segregated institutions of higher education. Under the amendments, a new panel of experts will be established to place people with disabilities in either segregated schools or mainstream schools “according to the types of disabilities and their learning abilities”  and their “ability to receive an ordinary education.”  In other words, the proposed mechanism continues to segregate a category of persons with disabilities from the mainstream school system, and this decision is made by a group of experts without any participation by families with children with disabilities in the process. Examples of reasonable accommodation include holding classes on the ground floor; providing note-takers; allowing for additional time for note-taking or during exams; priority seating for students to minimize distractions and enable them to see and hear the teachers; providing assistive devices such as magnifying equipment or tape recorders; providing sign-language instructors; reading aloud written materials for students with visual impairments; and structural modifications to schools, such as ramps. Relevant Chinese regulations stipulate the establishment of “resource rooms” within mainstream schools and “resource centers” in a given area to provide guidance, equipment, and support to facilitate education for children with disabilities in the mainstream education system. They also stipulate that teacher training institutions include classes on special education and that educational authorities include training in special education at all levels of teachers’ training programs. While the provision for resource rooms and resource centers is certainly a step in the right direction, any positive effect they might have is hampered by the fact that Chinese laws and regulations do not clearly require that schools provide students with disabilities “reasonable accommodation” as defined in international law. The closest equivalent is in the LPDP requirement that the government provide “special assistance” to people with disabilities so as to “alleviate or eliminate the impact of their disabilities and external barriers and ensuring the realization of their rights.” However, the choice of the phrase “special assistance” suggests that such assistance is out of the ordinary rather than a necessity and a right. Similarly, the REPD states that mainstream schools should provide “help to [meet] special learning and rehabilitation needs”; and the Education Law and the CEL stipulate that schools should provide “assistance” and “convenience” — the vagueness of the terms again raises questions about whether the accommodations are rights to which students are entitled or favors bestowed by the schools. Another set of government regulations, Regulations on Construction of a Barrier-free Environment, was enacted to “ensure equal participation of persons with disabilities and other members of the community in social life,” but the regulations only refer to general accessibility measures. The proposed amendments to the REPD mention “reasonable accommodations” twice, but provide no definition of the term or examples of the kind of support schools are obligated to provide to students with disabilities. None of the laws, regulations, or the proposed REPD amendments outline any consequences if the government or the schools do not offer such support. They also do not recognize denial of reasonable accommodation as a form of discrimination, as required under the CRPD. More problematically, the limited “assistance” and “help” that schools must provide is conditioned on whether children are “able to adapt themselves to study in ordinary classes,” as stipulated in the CEL and the REPD. On the one hand, schools are supposed to provide assistance and flexibility to students with disabilities; on the other, students are supposed to show themselves able to adapt to study in mainstream classes. In practice, the burden of proof is on the students themselves — during enrollment, throughout the academic year, and as they advance in school — to show that they can adapt to existing school requirements. Although the Chinese government is obligated by international law to ensure that all children have access to the general education system regardless of disabilities, families told Human Rights Watch that children and young people with disabilities are denied admission by mainstream schools in their areas, pressured to leave the schools, or effectively expelled because of their disabilities. They also reported that schools do not provide reasonable accommodation. Teachers are not given the necessary support or training to work effectively with students with disabilities; classrooms are physically inaccessible and lack appropriate materials; and student evaluation methods lack flexibility. Some children and young people with disabilities do overcome all these barriers to education. Parents play a crucial role in this process, but generally lack awareness of their children’s educational rights and options. Many parents told Human Rights Watch, for example, that they were unaware of the concept of “reasonable accommodations” or that the government and schools are legally required to take measures that allow children with disabilities to study at mainstream schools. Instead, as noted above, several told us that it is their children who are “defective” and need to adapt to the classrooms. A few parents with financial means told Human Rights Watch that they quit their jobs to accompany their children in school, moved to a different neighborhood with more accepting schools, or started new private schools for their children and others whom mainstream schools would not accept — just to improve the odds of their children getting the education guaranteed to them by law. Most children whose parents are unable or unwilling to provide support are denied the opportunity to be educated altogether. Among the 47 families interviewed by Human Rights Watch, six children and young people with disabilities never attended school and six dropped out from mainstream schools along the way. Most of those who do not attend schools live in rural areas. We went to many schools, it was so hard. Nobody would take him. We felt terrible as parents…. At the time, the class teacher agreed to take us, but the one in charge of student discipline wouldn’t. I think he was afraid of the responsibilities. The mother of Chen Yufei said the mainstream school in her village refused to enroll her nine-year-old boy because of his disabilities. The primary school near us wouldn’t enroll us. I went several times but they wouldn’t let him in … I have been especially angry because of this…. This is because my child is different. Other children in the village who are at a worse [academic] level are all enrolled. [The school said] the conditions at the school aren’t adequate, that they do not have enough staff members to take care of these kinds of children, that he can’t control his behavior.... I went to about three schools, every one of them refused to take us, they all said the conditions in the schools don’t meet the standards. The people at the kindergarten didn’t want him, we brought him to the kindergartens in Guangzhou City, they all wouldn’t enroll him, they said they affect the other kids [in the school]. [T]he school said that unless a parent accompanied the child, [they could not enroll the child] because the teacher has to prepare for class. The teacher cannot accompany the child to the bathroom, or do much else … so the parents agreed and let the grandmother accompany the child, taking him to drink water and to the bathroom. If you can do this much, then the schools may take you. A few parents told Human Rights Watch that before children with disabilities are admitted, they have to sign agreements with the school releasing the school of responsibility should their children fall ill or be hurt. We have an agreement with the teacher, which we sign every year because our child is different from normal children. [We have to promise that] if the child’s sick and so on, it has nothing to do with the school. It’s a liability waiver. In two out of the nine cases we investigated in which children were denied enrollment in mainstream schools, the children are currently out of school. One is Yu Yuechun, a 13-year-old with an intellectual disability, whose grandmother told Human Rights Watch that schools would not enroll him because “he can’t learn.” Prior to that, he was expelled from school after half a year. When he was seven he went to primary school for half a year, but after he had fights with the other children, the school wouldn’t let him continue. Then we went looking for other schools, but they said he can’t learn and wouldn’t take him. [A]t most you can stay there for one or two years before you are very tactfully asked to leave. In my experience, it is difficult to find a school and get admitted, but if you belong to the school district then they can’t refuse [to enroll] you…. They admit your child but find opportunities to tell you that they want you to transfer your child to another school. There was a school near us but they dismissed me…. Because I didn’t learn well…. I didn’t know what to write during exams. I was really bored so I looked at other [students]. The teacher saw me and told me to leave…. But I didn’t look at others’ [papers]. A math teacher gave me a scolding [after] he gave me zeros for every exam, and then he said some very nasty things. I couldn’t stand it … and when he told me to go home, I went home…. The principal told me himself that because my math is no good, I should contact this [special education] school. You’ve brought him to a normal environment, thus it is he who must adapt. —The mother of Zheng Jun, a boy with autism, recalling the words of his teacher at a mainstream school, January 2013. Human Rights Watch research found that little to no accommodation is provided in mainstream schools for students with disabilities at all stages of education. Students with severe mobility impairments said they need to go up and down the stairs to get to their classrooms or use the bathrooms. Those with hearing impairments said they have no written notes provided and there is no sign language instruction available; mainstream schools described to Human Rights Watch do not readily provide visual aids, Braille, electronic materials, or enlarged texts for students with visual impairments. Children with intellectual disabilities are expected to sit through the entire curriculum together with the rest of the class with little modification to the curriculum or teaching methods to meet their learning abilities and needs. None of the schools at which the interviewees study have resource rooms. Our interviewees also described a lack of flexibility in the evaluation of student performance in the mainstream system, noting that schools fail to modify tests or exams to accommodate students with disabilities. In higher education, blind students are effectively barred from mainstream education because Braille or electronic exam papers are generally unavailable during gaokao, while deaf students are severely disadvantaged as listening exams are a requirement for a national standardized English test required for university graduation. Students with disabilities and their parents told Human Rights Watch that few teachers take the initiative to provide them with reasonable accommodation and, in some cases, teachers neglected or even humiliated them. While a few said that their teachers have better teaching styles or provide them with better support, such efforts are inconsistent. Lack of support and training to teachers and school administrators, lack of funding to schools for inclusive education, and the fact that evaluation of educators rarely takes into account the performance of students with disabilities all contribute to schools’ failures to ensure reasonable accommodation. Some individual teachers would take the initiative to ask me if I understood, and that I could ask them anytime if I don’t … but that’s very rare. In three years at university, I have experienced [such initiative from teachers only] five times. We have no examples [of accommodation]. The teachers treated me the same as other students. Students with intellectual disabilities are expected to sit through the entire curriculum together with the rest of the class — as one parent puts it, “even when they can’t understand.” Worse still, a number of students with intellectual disabilities or autism and their parents reported to Human Rights Watch that teachers intentionally ignored them due to their poor academic performance. Mother of Chen Xiaoling, who has intellectual and visual impairments, said Chen was placed in the back of the class. The teacher didn’t pay any attention to her, she didn’t get any exams or homework, she just sat at school. The teacher didn’t care which parts she didn’t understand…. Her eyesight is very bad…. She certainly couldn’t see anything. She was moved to the back of the class because she couldn’t follow the class. I bring the child to school and the teacher would let him in, but if he leaves [during school], the teacher doesn’t stop him…. It’s like this every day. The school hasn’t given him textbooks but we bought him some notebooks so he could draw. A few interviewees reported being given some accommodations in mainstream schools, but the efforts are inconsistent and sporadic at best, dependent on the attitudes of individual teachers and schools. Some teachers have teaching styles that make it easier for students with disabilities to follow. Sixteen-year-old Liu Yiyuan said some of her teachers wrote down notes on the blackboard and spoke slowly; others did not write anything down and she “couldn’t keep up.”  None of her teachers provided written notes and they walked around the classroom while teaching, sometimes standing at the back of the class. I have a student who was paid so little attention by the teachers between primary one and three that he felt he was like “a sheep put out to pasture.”… When he was in primary four, one teacher discovered that when he magnified the exam papers, the child performed very well, so he then made large prints of the exam papers for this student…. This kind of support is not ensured by the system but stops at the level of awareness and goodness of the hearts of the teachers. point a loudspeaker right at him but he still could not understand what the teacher said even though he wears a hearing aid. Sometimes the teacher gets so mad. Because of the lack of government or school support for educators, as one parent put it, “it is the parent who provides the support.” The same parent noted that when “the teachers are good, then they help you or ask the other students to help you, but most of the time, the burden falls on the parents.” In some cases, schools make the parents agree to provide support as a condition for enrollment, or the parents take the initiative to offer such support in a bid to get their children enrolled. The principal said, “For people like [your daughter], I suggest she go to the school for the deaf because our school does not have students like her.” I told him that my child would like to study [here] and he said, “She might want to study [here], but the question is whether or not she can.”… Then he talked about making guarantees, that if my child can’t keep up in class, then she can’t take the exams or be enrolled. After she was enrolled she did well, so she has been taking the same tests as other students. He takes his exams together with others, but since primary two, the teacher hasn’t given him his grades… He minds such things very much. He knows … Sometimes he said he did better than his classmate in the exams, but his classmate got a score and he didn’t. The child’s performance is not included in the evaluation [of the teacher], so the teacher doesn’t care. He has so many students in his class. He has no energy, nor the willingness to take the initiative to help such kind of children. Teachers and school administrators lack training in inclusive education, while schools lack funding for providing support to the teachers to make accommodations possible. Although the Law on the Protection of Persons with Disabilities (LPDP) and the Regulations on the Education of Persons with Disabilities (REPD) stipulate that institutions that train mainstream teachers must include courses on teaching students with disabilities, a survey of these institutions show that only 13.9 percent of them do so, and only a minority of those do so regularly. Although on-the-job training is available from bureaus of education, the sessions are short and the number of teachers trained remains low. Most teachers of students with disabilities still have not received such training, and there is no clear timeline to ensure that such standards are met for all mainstream teachers. The principal of the school attended by Zheng Leyan, a girl with an intellectual disability, told Human Rights Watch that he wished that her class teacher could be trained in special education. According to him, the local bureau of education has never made such arrangements. “I have no idea how they teach [children with disabilities],” he said. Mainstream schools often receive little or no funding to provide accommodations for children with disabilities, even though Chinese regulations on disability and education stipulate that funding be allocated by local education bureaus to mainstream schools for that purpose. In a 2006 survey, only 7.7 percent of mainstream schools that enrolled students with disabilities reported that their local bureaus of education had earmarked sufficient funds for these children, while over half of the respondents said there was either no designated funding or that the funding was very little. Educators interviewed by Human Rights Watch also said that while they have to report to the local bureau of education that they have children with disabilities in the school, they receive no additional funding from the bureau for the children. Rather than being earmarked to ensure reasonable accommodations, available funding is used to waive miscellaneous fees and provide a small cash subsidy to the students with disabilities (the policy of “liangmian yibu” or “two waivers and one subsidy”), or goes to provide a small subsidy for teachers to “motivate” them to better educate students with disabilities in their classrooms. I fell and cut open my leg, so I couldn’t walk. If I didn’t fall then, I could have carried him on my back…. We have no other way [to send him to school]. We don’t own our home and his father has to go to work…. I spoke with the principal and told him that after the new year I’d bring him to school in a cart … but I’m afraid that I might not be able to pull the cart given my poor health. As noted above, about 75 percent of people with disabilities in China live in rural areas, and government consolidation of mainstream schools in rural areas is estimated to have closed down half of all rural schools in the past decade. This has meant that mainstream schools are now even further away from some rural students. This places an extra burden on parents because they need to organize transport or rent a room near the schools to accompany their child. Some of these schools provide residential facilities, but there is no support staff to take care of children with disabilities. The [village] school was closed and consolidated in 2010…. If it was still here then I’d let her continue [in the village school]. No, it’s too far away. The centralized school is about 17-18 kilometers away. It’s not possible, we would have to rent a flat [near the school], how is it possible? She wants to study, and she’s cried about it. She graduated from primary school, but she cannot continue…. She could go to junior high school, but the school is too far away. She can’t walk there but she also doesn’t know how to ride a bike…. The main reason is still no one to send her to and back from school. Parents and students we interviewed also said that mainstream schools and local governments fail to ensure that students with disabilities both have easy access to their classrooms and are provided with alternative means of communication and assistive devices. Visual aids and large print materials are not readily available for students with visual impairments in mainstream schools. They also typically do not offer Braille and are not equipped with Braille teachers. As a result, most students who are blind or with low vision go to special education schools because they have better facilities than mainstream schools and because mainstream schools are reluctant to accept them. Even if Wang takes the exams, she would be unable to participate in class like normal students and since ordinary universities cannot provide Braille textbooks, she cannot receive a normal education in ordinary schools. However, the LPDP stipulates that for “school entrance exams, career qualification exams and placement exams which blind people take part in, Braille or electronic exam papers or assistance from specialized staff shall be available.” The Regulation on the Construction of Barrier-Free Environments also has a similar requirement. In response to an information disclosure request sent to all 31 provinces and municipalities, out of eight bureaus of education which responded directly to the question only the Shanghai bureau said that it had provided Braille exam papers in the past four years. The CDPF told us to go [get hearing aids] but … they didn’t give her any [because they said] she was too old and she wouldn’t be able to hear anything even if she’d be given hearing aids. Information about where and how to obtain these devices is also not readily available to the parents. Two families we spoke with reported that their children had no hearing aids because they did not know how to apply for them. Whether or not a child with a hearing impairment gets a quality assistive device depends on a variety of factors and their own efforts to search for funding. The government’s Regulations on the Education of People with Disabilities (REPD) do not mention the provision of assistive devices for students with disabilities. A current university student who lost her hearing while she was in secondary school told Human Rights Watch that she had to take a part-time job to afford the hearing aid. It was during my first year in university that I struggled to earn money to buy myself hearing aids that cost several hundred renminbi, and later I met a sign language teacher who lent me money so I bought a couple of better ones. Now I can hear in the classroom, but not clearly. While the policy looks good on paper, some parents told Human Rights Watch that schools failed to provide any modifications to homework, tests, or exams to accommodate their children. One child with cerebral palsy who writes slowly has never been given extra time to write his exams. Another parent said the class teacher denied her request to reduce the volume of the written homework assigned to her child, who has autism and is poor at responding to questions in written format. Yet another interviewee with hearing impairments reported that she has to take English listening exams at schools. Students with hearing impairments are exempted from the listening portion of gaokao exams but not from the listening exams for the College English Test, which are national exams administered by the Ministry of Education. University students are often required to pass these exams in order to graduate at both bachelor and graduate levels. As interviewee Li Hongdan put it, she could “only guess” the answers to the listening test as she could barely hear anything. Li tried to speak to her teachers about providing accommodations during the internal school assessment, but she was rebuffed. Study or Just “Muddle along with the Class”? The shortcomings described above fail not only students with disabilities but their parents and teachers as well. Other than those involving mild physical disabilities, in almost all the cases we examined the parents or children said they were failing academically or had already withdrawn from mainstream school. One aim of mainstreaming is to combat stereotypes and prejudices, but placing these children in mainstream schools without ensuring reasonable accommodations undermines this important goal. While some of our interviewees reported that they were treated well in school, a number said they were treated badly by fellow students. Tong Ying, a 17-year-old girl with physical disabilities, told Human Rights Watch that she prefers special education school. Here we are all disabled, we are equal. I went to mainstream primary and junior middle school but I didn’t like them. I was beaten by teachers during primary school and bullied by fellow students. Lots of other students looked down on me. In turn, these barriers lead to declining confidence and a lack of interest in learning among students with disabilities. Some eventually drop out while others transfer to special education schools. Eleven of our interviewees joined special education schools after they were rejected, effectively expelled, or otherwise excluded from the mainstream system. In one interview, Du Ting, a 15-year-old girl with a hearing impairment, left a mainstream school because she was scolded and sworn at by fellow students, who felt “she was lower than other children in the mainstream school.” Chen Xiaoling, who has intellectual and visual impairments, quit school after primary four because she “was afraid that others would laugh at her” due to her poor academic performance. Chen Yangfei left school in 2012 at age 8 because he had “no motivation to learn” as a result of barriers due to hearing and speech impairments. Few students with disabilities reach higher education. Those who do tend to be ones who have physical or mild disabilities, and they face additional barriers as a result of government policy. All students applying to universities must submit the results of a detailed physical examination, along with their academic records, for consideration. These include a record of the student’s self-reported medical history, including the presence of disabilities, along with a doctor’s assessment. The Ministry of Education, the Ministry of Health, and the CDPF have a set of guidelines advising universities on the type of “physiological defects” and “illnesses” that make a person “unable to take care of themselves or complete their studies,” and these can be grounds for denying them admission to universities in general. Although only “guidelines”, they send a clear signal to universities that they can discriminate in admissions on the basis of students’ physical or mental attributes or disabilities. Ran Yanshan, who has a visual impairment as a result of albinism, told Human Rights Watch that he was denied admission to study a Bachelor’s degree program in English at Guangxi University, his top choice, after he failed to pass the visual component of the physical examinations. The guidelines also put people with disabilities in a difficult position. If they state their conditions fully as required, they risk discrimination by the universities; if they fail to report their disabilities, they risk being subsequently rejected due to dishonesty. In past years, a number of press reports have documented that several students with disabilities were rejected by universities for failure to report their disabilities. People with visual impairments, depending on the severity of the impairment, can be denied admission to a dozen academic fields, including sports training, and are advised against applying to dozens of other fields including law and ecology. Admission requirements for the police academy explicitly prohibit people with all disabilities from applying. People with physical disabilities are advised against applying to more than 40 fields including environmental science and archeology. People with hearing impairments are advised not to study over a dozen subjects including law and foreign languages and literature. Jimei University in Fujian Province stipulates that students who wish to study navigation technology must be “healthy and handsome men over 1.65 meters tall who can speak clearly, have normal liver function, have an uncorrected visual acuity of 5.0 in both eyes, and have no color blindness.”  It is hard to see how these criteria — having a “handsome” appearance and clarity of speech — can be justified as essential requirements for the subject. These standards could exclude many competent students, including those with physical or speech disabilities. Data available between 2001 and 2007 from the CDPF indicates that, on average, about 8.3 percent of candidates with disabilities were not admitted even though they had obtained the required scores and that, encouragingly, the percentage has gradually declined over the years. This relatively small percentage, however, must factor in how many students with disabilities never reach higher education, as well as the reality that others may be dissuaded from applying to their preferred universities and academic fields by the government guidelines described above. Most of my university friends who have hearing impairments and I chose subjects like accounting and fine arts. This is because from the beginning we have avoided field of study that might reject us. Ran Yanshan also told Human Rights Watch that prior to being denied admission to university on the grounds of his visual disability, he had carefully chosen subjects that do not have a strong visual requirement. I had a two-pronged strategy: first, I applied to study English because it shouldn’t have too high a requirement on visual abilities…. Second, I indicated in my application that I would be willing to obey their subject arrangement, so if they think I am not suitable to study English, I am willing to be allocated to another subject [by the university]. The Convention on the Rights of Persons with Disabilities (CRPD) requires that the Chinese government “employ teachers, including teachers with disabilities, who are qualified in sign language and/or Braille,” prohibits discrimination in employment, and requires that employers provide reasonable accommodations in the workplace. While there are teachers with disabilities in the special education system, government policies discriminate against them in the mainstream school system. Because the gates for the special education schools are always closed for security reasons, once the children are inside it is very difficult for them to come out. — Lan Yingying, a scholar who studies China’s special education schools, April 2013. In general, special education schools in China have trained teachers and appropriate equipment and facilities and are resourced and funded well. Over half of the students we interviewed who studied in this system said they like studying in these schools. Most of the students who transferred to these schools from mainstream schools noted that their new teachers give them better and more individualized support, and they report that they are generally happier and more confident in these schools. However, there are a number of problems with the special education system. The schools are far away from some of their prospective students. Most are isolated from their immediate communities and do not serve certain disability populations, notably students with autism. The slower pace of progress through the curricula, limited subject choices beyond basic education level, and lower academic standards make it difficult for students to rejoin the mainstream system. There are currently 1,767 special education schools in China, which, given the size of the country, means they are still few and far between compared to mainstream schools. Moreover, special education schools tend to be located in urban or administrative centers, and thus are especially difficult to reach for students who live in rural areas (as noted above, 75 percent of people with disabilities in China live in rural areas). Even if there are special education schools in a particular area, they may serve a specific disability — such as hearing, visual, or intellectual disability — and children with other disabilities may still need to travel long distances. Some students have to be removed from their families and communities from a young age to study in these schools, most of which provide residential facilities. The schools are too far away. She doesn’t know how to care for herself and someone will have to take care of her. She can’t even carry her own bath water, she’s too young and she can’t take care of herself. The [mainstream] schools here are closer, she’s so little — I can take care of her here [at home]. Attendance at such remote special education schools can impact the psychological health of the children too. Chen Fei, a teacher in a residential special education school, told Human Rights Watch that many children are no longer “used to living at home” with their families and would prefer not to visit home. We observed that for children under 11 or 12 years old, if they live in schools for a long time then they develop communication and emotional [attachment] problems with their parents…. The main problem is that they lack understanding of life at home and the entire society in general because they have such a narrow and fixed social circle. Article 19 of the Convention on the Rights of Persons with Disabilities (CRPD) obliges states to ensure that people with disabilities enjoy “ full inclusion and participation in the community” and prevent “isolation or segregation from the community.” However, a number of interviewees reported that students at special education schools are discouraged from leaving the gated premises, and the students have little interaction with people and places outside. All students have to live in the schools and can only go home during the weekends. This is done for safety reasons — because all the students have disabilities … they are afraid of accidents. In 2010, the first and only government school for children with intellectual disabilities was established in our city. There were only 200 seats and … they didn’t try [to enroll] kids with autism…. Their enrollment capacity is limited, so this kind of children [with autism] are basically excluded because one cannot control their behavior ... these children cannot even go to publicly run special schools for children with intellectual disabilities. The higher education system has not opened doors to those from special education schools, and as a result these schools lack a motivating mechanism…. Instead, [students from special education schools] might go to those very simple special education colleges with designated seats for students with disabilities, which have very low enrollment standards. I have some background in massage, I learnt it from Primary 3 to Secondary 1 … because it was a class arranged by the teachers, you can’t refuse. For deaf kids there is cake decorations or beauty treatment. Because we are blind, there is only one [vocational training option]: massage. Another recent graduate from a special education technical college told Human Rights Watch that students in his college are also placed in different vocational training classes depending on their disabilities — massage for the blind, fashion design for the hearing impaired, computer studies for those with physical disabilities. He was trained in massage and he works as a masseur, but he doesn’t like it. In another example, at Special Education College of Changchun University, one of the 18 mainstream higher education institutions in China that have special education colleges for students with disabilities, only five subjects are available. They are acupuncture and massage, musical performance, painting, art, and design and animation. A major in special education is only available for “able-bodied” students. —Mother of an eight-year-old boy with hearing impairments, Guangdong Province, February 2013. Parental attitudes and resources play an important role in determining whether children with disabilities can overcome the multiple barriers preventing them from attending school or getting a proper education. In some cases, however, parents and grandparents themselves are the first barrier: they do not think that their children are capable of learning and thus do not bring them to school. To ensure that children with disabilities have access to education, a critical step is to inform parents about their children’s right to education and their educational options. The parents we spoke with said they had little regular contact with the China Disabled Persons’ Federation (CDPF) or the Ministry of Education regarding their children’s education, had little awareness of their children’s right to education and to “reasonable accommodation” in mainstream schools, and had little information about the special education schools near them. How can he go to school? He can’t sit properly, he can’t even hold a piece of cake steadily! His hands don’t work — how can he go to school? He watches TV every day, so if there is an idiom [on TV that] he doesn’t understand, he asks me. Zheng lives in a Cantonese-speaking area, but he learned to understand Mandarin from the cartoons he watched. He has no friends and only ventures out when his grandparents have a moment to carry him on their backs for a walk. Lu Xiaoyan, a 14-year-old who has a physical disability, told Human Rights Watch that she would really like to go to school, but her father said she cannot because “everything is inconvenient” at school, she cannot even “eat a meal on her own,” and that there is no one who can care for her there. Similarly, 13-year-old Zhang Xiaoli wanted to go to secondary school after she finished primary education, but her grandmother has never brought her there because the school is too far away and she cannot arrange the transportation. She worries that the school would not enroll Zhang, and explained that she “cannot learn” anyway. No, I don’t know that kind of school…. His father is working far away from home and I’m going on 80 years, I’m too old to figure these things out. It is your child who is the problem. He is faulty…. The teacher has to teach 50 normal children so she can’t just teach your one child, he learns whatever he manages to learn. She is enrolled right now and as long as she keeps up with the class then that’s OK. The teacher said that if she can’t keep up, then she would not be counted as enrolled. This teacher has given us preferential treatment. According to a disability rights activist who frequently visits children with disabilities in rural areas, parents almost never ask for any form of accommodation. Although the CDPF maintains a comprehensive database of children with disabilities who have disability cards and reaches out to some of them regularly by conducting home visits, it fails to consistently help them and their parents identify and surmount barriers to education. Almost all the children interviewed by Human Rights Watch who were out of school have disability cards issued by the CDPF, but only two have regular contact with members of the CDPF. Of the two, only one was contacted about education: after the child, who has hearing and speech impairments, was dismissed from school and no other mainstream schools nearby were willing to take him, the CDPF helped to place him in a special education school. The rest of the interviewees said they had no contact with the CDPF after obtaining disability cards. About three years ago … I brought my child back to my hometown to get a disability card…. It took them a year to send the card back … but the CDPF has never given us any subsidies or any other help, we just got an identification card. The CDPF has never contacted me and I have never contacted the CDPF…. I am uneducated and I don’t even know what to ask from them. No, nobody has ever asked us about [his education] … the CDPF has never visited us. It was only through someone in the village that I heard about a rehabilitation center [run by the CDPF] in the county town. When confronted with discrimination, students with disabilities and their parents sometimes seek help from the CDPF. The CDPF plays the role of the broker between parents and schools to find solutions. CDPF official Zheng Wei told Human Rights Watch that he had handled three cases of denied admissions — and he got the children enrolled in schools of their choice after first talking to the schools and then to the local bureau of education to put pressure on the schools. When he applied for the subsistence allowance, the CDPF sent someone to ask about his situation. I told him all about [being denied admission to school] but nothing happened…. Only the application for the subsistence allowance went through and we get a bit of money every month, but it was otherwise useless. They’d come to send their regards during the new year, send us a barrel of cooking oil, that’s about it. We have a parents’ organization and we petitioned [the government] several times. We went to the Bureau of Civil Affairs, to the CDPF, to every one of them. But their response was, basically, to kick us around like balls. They said, for matters concerning special education, you should talk to the Bureau of Education; but the Bureau of Education said [these children] are disabled, so those should be matters for the CDPF. And then another one says there is no national policy on this issue, what could we do about it? A CDPF official, speaking on condition of anonymity, told Human Rights Watch that the quasi-governmental organization’s intervention is often not to ensure reasonable accommodation, but to take the path of least resistance. This often results in placing the children in special education schools. In practice we treat people with disabilities differently…. When [mainstream] schools refuse to accept children with disabilities, they send them to the CDPF for an evaluation. For all those who have [CDPF-issued] disability cards, the CDPF makes them go to the local special education primary school … this is illegal! Nine years of compulsory education — [the CDPF] should help people with disabilities to defend their rights! They should have resolutely prohibited [mainstream] schools from denying them admission! But the CDPF is doing the opposite. The Ministry of Education has also contributed to the problem by failing to take action in cases of discrimination. In response to an information disclosure request sent to all 31 provincial and municipal bureaus of education by a disability activist in 2013, only five bureaus directly answered a question about denying admission to children with disabilities. Those five — which included the bureau for Gansu Province — wrote that they had never taken any action against schools for denying admission because they had “never found” any such incidents or “never received any such complaints,”a claim that seems implausible on its face. Indeed, one of the cases we investigated for this report involved discriminatory denial of admission to a disabled child by a school in Gansu Province. [The court] said the school has autonomy over enrollment, so this does not belong to the remit of administrative lawsuits, also because the school is not an administrative department. I said it is a civil case, and [the court administrator] said it isn’t. I asked him “What kind of a case is this then?” He said “Not everything can be resolved through lawsuits.”… I see what is written in the law, but it has lots of flexibility, so what can I do? Anyway, I tried petitioning the provincial governments and other courts, but none of them would take the case. The CDPF, I tell you, it does not dare to confront those higher up, they are willing only to send messages down [the hierarchy]. I spoke with them many times. I also arranged for a group of journalists to interview the provincial CDPF, but the CDPF told them they could do nothing…. The CDPF has very limited ability; there is no use asking them for help. The Convention on the Rights of Persons with Disabilities (CRPD) requires that governments adopt “immediate, effective and appropriate measures” to raise awareness in society about people with disabilities, combat stereotypes about them, promote respect for their abilities and contributions, and, importantly, encourage society to view people with disabilities as “independent and autonomous rights holders” with dignity equal to other human beings rather than as objects of pity and charity. Despite its ratification of the CRPD, the Chinese government continues to use pejorative terms to refer to people with disabilities. The term for people with disabilities, canjiren, which is used in official documents including the official translation of the CRPD and is prevalent among Chinese people, literally means “impaired and sick people.” In its review of China, the Committee on the Rights of Persons with Disabilities noted “the prevalence of the medical model,” rather than the social model, in the government’s definition of disability, official discourse, and official awareness-raising campaigns. The official volunteers at the school…have regular activities to ‘help the disabled,’ which is to gather our friends with disabilities and go for a walk at the park. And then these students would push the wheelchairs enthusiastically for photo-ops. I’m particularly disgusted about this…. Every time it’s the same people with disabilities while there is no help where the real needs are. You see the LPDP and the CRPD? They’re just there to gather dust…. The CDPF prints out all these and hands them out randomly, it’s just window-dressing.... The CDPF isn’t like us — when we hand them out, we talk to people about it, just as I explained this and that paragraph to you. Rights? What are these rights?... We don’t know these things, and we don’t dare to raise these demands to the school. I’m happy as long as they let us stay in class, even if there are other issues at school. I don’t dare to raise [rights]. Some municipalities and provinces in China, especially in coastal regions, are making efforts toward a more inclusive education system. In Beijing, for example, the municipal government has announced that it will stop building more special education schools and instead will shift resources to integrate students into mainstream schools. It says it will improve the physical accessibility of mainstream schools and hire “rehabilitation teachers” to provide support to students with disabilities. Beijing municipal authorities have also reportedly established “resource centers” to provide support to teachers of students with disabilities in mainstream schools. Beijing and other cities in more developed parts of the country, including Shanghai, Qingdao City in Shandong Province, and Guangzhou City in Guangdong Province, have also established “resource rooms” in mainstream schools. The bureau of education in Xinjiang Uyghur Autonomous Region has also reportedly equipped all new schools with accessibility features and converted four mainstream schools to improve accessibility in recent years. Inclusive education does not have to be costly. For example, to improve physical accessibility it might be sufficient to move a classroom to the ground floor with no further building modifications necessary. Even where modifications are necessary to ensure that buildings are physically accessible to people with disabilities, making the necessary adjustments usually costs only 1 percent of the overall building cost. With some other disabilities, such as hearing impairments or deafness, modifications to teaching technique can make huge differences. In Beijing’s Chaoyang District, the bureau of education reportedly trains teachers to accommodate students with disabilities. Teachers are taught to avoid walking around the classroom while talking, to keep background noise to a minimum in the classroom, to consider the contrast of colors in designing teaching materials and presentations, and to pair students with hearing and visual impairments and those without to provide some assistance in class. The costs are often higher, of course, for students with more severe and multiple disabilities. Even in these cases, however, simple accommodations can still be helpful in aiding learning. And in these cases, the government can mobilize parents and set up parents’ networks to provide support to the students. But it is essential that parents be given a choice as to whether or not to play a support role and be given resources, training, and support when they choose to do so. While providing accommodations to students who need the most support can be expensive, it is important to keep in mind that developing and maintaining a separate and complex special education school system — as is the case in China — might cost more than accommodating most students with disabilities within an inclusive system. Some provincial government authorities have shown an interest in improving access to mainstream schools and a willingness to test out inclusive education approaches. Hopefully, through these initiatives the national Ministry of Education and its provincial and local offices will recognize that inclusive education can be achieved and reasonable accommodation can be provided, make commitments to replicating successful projects nationally, and develop a national strategy on inclusive education. It is critical for the Chinese government to immediately review and revise its laws and regulations to provide clear legal definitions of non-discrimination and reasonable accommodation, consequences for non-compliance, and an effective redress mechanism to deal with potential grievances. The government should also affirm its commitment to inclusive education and formulate a concrete plan to ensure that teachers and school administrators are provided with adequate funding, training, and an evaluation mechanism that motivates and supports teachers to carry out inclusive education. Central to this plan are parents and children and young people with disabilities — the government should ensure that they are informed about children’s educational rights and options and empower them to get involved in the formulation and implementation of the plan at all levels of education. Only then will education of students with disabilities be more than just “muddling along with the class” and genuine inclusive education become a reality. State clearly that the Chinese government’s overarching goal in the education of people with disabilities is full inclusion at all levels of education and define “inclusive education” in accordance with article 24 of the CRPD. Define “reasonable accommodation” in the amended regulations in accordance with article 2 of the CRPD, and stipulate that the Ministry of Education and its local offices are responsible for ensuring that schools and examination boards provide people with disabilities with reasonable accommodation within the general education system, including the use and teaching of Braille and sign language. Remove the phrase “able to adapt themselves to study in ordinary classes” from the REPD because it allows mainstream schools to discriminate against potential students on the basis of physical or mental characteristics or abilities; remove the phrase and any comparable discrimination-enabling language from all other education laws and regulations. State explicitly that mainstream schools which refuse to admit students or effectively expel them on the basis of disabilities are subject to sanction by the Ministry of Education. Specific timelines with measurable goals. An adequate budget that includes financial and other support to provincial and municipal bureaus of education which might not have adequate resources to deliver inclusive education. Measures to ensure that resources, including teachers, expertise, and equipment, are shifted from developing the special education system to making the mainstream system inclusive. A plan to train teachers, school administrators, and education officials at “all levels of education” in “disability awareness and the use of appropriate augmentative and alternative modes, means and formats of communication, educational techniques and materials to support people with disabilities,” as required by article 24(4) of the CRPD. Such a plan should be drawn up in consultation with independent disabled peoples’ organizations and parents’ organizations in the country. With the assistance of the Ministry of Health and the China Disabled People Federation (CDPF), immediately repeal the Guidelines for the Physical Examination of Students in Recruitment for Ordinary Higher Level Educational Institutions which sanction disability-based discrimination in higher education. Provide financial and other resources, including adequately trained staff, to mainstream schools so that they can ensure the provision of reasonable accommodation for pupils and students with disabilities. Impose penalties on managers of mainstream schools that refuse admission to or expel students on the basis of disability, deny reasonable accommodation, or otherwise discriminate against students with disabilities by act or omission. Provide accessible transport to enable children with disabilities to access schools, especially in rural areas where distances to schools are great and the number of schools has been reduced. Establish formal mechanisms in schools at all levels of education for the active involvement of parents and children and young people with disabilities to ensure that they participate in consultations, decision-making, and monitoring processes in the implementation of inclusive education. Provide training in the principles of inclusive education to staff at CDPF and independent disability organizations to enable them to support families with children with disabilities. Amending the Regulations for Implementation of Teacher Qualifications to remove provisions which allow local governments to disqualify candidate teachers based on physical or mental characteristics not relevant to the particular job. Providing them with the necessary reasonable accommodations. Monitor the school system’s compliance with relevant laws and regulations. Receive complaints about discrimination and lack of reasonable accommodation at mainstream schools. Identify remaining barriers to quality and inclusive education for students with disabilities. Make recommendations on actions the Ministry of Education can take to ensure access to inclusive education. Ensure that parents are informed of their children’s rights to an inclusive education, reasonable accommodation, and non-discrimination. Provide assistance to these families to make sure that they enjoy these rights in practice. Together with the CDPF and independent disability organizations, improve the distribution of assistive devices including visual and hearing aids and teaching materials such as Braille and large print textbooks, to children with disabilities in mainstream schools and coordinate such distribution with the schools. Ensure that special education institutions do not unduly segregate children with disabilities from the broader school-age population or from their families. Such can be accomplished by bringing children with and without disabilities into regular contact for activities and classes and allowing children with disabilities in residential facilities to reunite with their families as often as possible by providing more frequent free transportation between the schools and the students’ homes. Ensure that parents and children with disabilities are informed of their educational choices, including the option to send their children to special education schools. Together with the CDPF and the Ministry of Education, improve the early identification of disabilities in children and provide more comprehensive and regular individualized health and educational assessment for children with disabilities beyond simply issuing disability cards, which only note broad and simple disability categories. Remove all forms of restrictions on nongovernmental organizations, especially those related to formal legal registration, and provide financial and other support to encourage the growth of independent disability organizations. This report was reviewed and edited by Sophie Richardson, China director; Bede Sheppard, senior researcher in the Children's Rights Division; Shantha Rau Barriga, Disability Rights Division director; General Counsel Dinah Pokempner; and Joseph Saunders, deputy program director. Human Rights Watch is also grateful to two experts on disability in China, who wish to remain anonymous, for reviewing the report. Production assistance was provided by Storm Tiv, Asia associate; Grace Choi, publications director; Kathy Mills, publications specialist; and Ivy Shen, multimedia and creative services officer. A China team research assistant and a research intern also contributed to the report. Human Rights Watch is grateful to all the children, young people, parents, educators, disability advocates, CDPF staff members, and government officials whom we interviewed for this report. Special thanks go to the disability advocates who assisted us in arranging the interviews, provided research support, and continue to advocate for improved protections for the rights of people with disabilities in China. Attention-deficit/hyperactivity disorder (ADHD): ADHD is a chronic condition that leads to the inability to sustain attention and to impulsive and hyperactive behavior. ADHD develops during childhood and might last through adulthood. It is a common condition that is estimated to affect between 3 to 5 percent of all children. Albinism: Albinism refers to a genetic condition characterized by a deficiency of melanin pigmentation in the skin, hair, and eyes that provides protection from the sun’s ultraviolet rays. Albinism affects people of all races and is not hereditary. People with albinism often have poor vision and are at greater risk of skin cancer. Autism: Present from early childhood, autism is a condition characterized by great difficulty in communicating and forming relationships with other people and in using language and nonverbal communication. Autism is believed to be caused by a combination of genetic and environmental factors which influence early brain development. Cerebral palsy: Cerebral palsy is an impairment of muscular function and weakness of the limbs caused by lack of oxygen to the brain immediately after birth, brain injury during birth, or a viral infection. Often accompanied by poor motor skills, it sometimes involves speech and learning difficulties. Intellectual disability: An intellectual disability is characterized by significant limitations both in intellectual functioning (reasoning, learning, problem solving) and in adaptive behavior, which covers a range of everyday social and practical skills. Gaokao or The National Higher Education Entrance Examination: A nationwide academic examination that is administered in the last year of high school. It is considered very important as entrance to all higher education institutions in China depend on results from this exam, which is offered once a year. Almost all high school students in China take the gaokao. Mental disability: Mental disability describes persons with mental health problems such as depression, bipolar disorder, and schizophrenia. Mental health difficulties are considered disabilities when they affect a person’s full and effective participation in society and are thus often called psychosocial disabilities. See, e.g., “China vows to spend more on education for disabled,” China Daily, September 12, 2008, http://www.chinadaily.com.cn/bizchina/2008-09/12/content_7021268.htm (accessed January 3, 2013); Liu Weifeng, “Disabled Students Get New Focused Attention,” China Daily, April 6, 2004, http://www.chinadaily.com.cn/english/doc/2004-04/06/content_320831.htm (accessed January 3, 2013). In this report, the word “child” refers to anyone under the age of 18. The Convention on the Rights of the Child (CRC) states: “For the purposes of the present Convention, a child means every human being below the age of eighteen years unless under the law applicable to the child, majority is attained earlier.” CRC, art. 1, adopted November 20, 1989 (entered into force September 2, 1990), ratified by China March 2, 1992. Law of the People’s Republic of China on the Protection of the Disabled Person (中华人民共和国残疾人保障法, LPDP), adopted on December 28, 1990 by the National People’s Congress. It was revised on April 24, 2008 by the National People’s Congress and effective since July 1, 2008, http://www.cdpf.org.cn/english/law/content/2008-04/10/content_84949.htm (accessed April 11, 2013). National Bureau of Statistics of the People's Republic of China, “Report and explanation of the major figures in the second sampling survey of people with disabilities in 2006” (2006第二次残疾人抽样调查主要数据公报及说明), http://news.xinhuanet.com/politics/2006-12/01/content_5419388.htm (accessed April 23, 2013). World Health Organization and the World Bank, “World Report on Disability,” 2011, http://www.who.int/disabilities/world_report/2011/accessible_en.pdf (accessed May 7, 2013). United Nations, “Factsheet on persons with disabilities: Overview,” http://www.un.org/disabilities/default.asp?id=18 (accessed April 2, 2013). National Bureau of Statistics of the People's Republic of China, “No.2 report and explanation of the major figures in the second sampling survey of people with disabilities in 2006” (2006年第二次全国残疾人抽样调查主要数据公报（第二号）), November 21, 2007, http://www.cdpf.org.cn/sytj/content/2007-11/21/content_30316035_3.htm (accessed April 16, 2013); “15m impoverished disabled people live in rural China,” China Daily, April 11, 2013, http://www.chinadaily.com.cn/business/2013-04/11/content_16392948.htm (accessed April 16, 2013). China Disabled Persons’ Federation (CDPF), “The total number of persons with disabilities, the types and levels of disabilities by the end of 2010” (2010年末全国残疾人总数及各类、不同残疾等级人数), June 26, 2012, http://www.cdpf.org.cn/sytj/content/2012-06/26/content_30399867.htm (accessed April 23, 2013). The Chinese government has begun a three-year project to collect data on those with autism, which is believed to affect millions in China. See Nick Compton, “China moves to tackle autism with first study of prevalence,” South China Morning Post, April 2, 2013. National Bureau of Statistics of the People's Republic of China, “No.2 report and explanation of the major figures in the second sampling survey of people with disabilities in 2006” (2006年第二次全国残疾人抽样调查主要数据公报（第二号）), November 21, 2007, http://www.cdpf.org.cn/sytj/content/2007-11/21/content_30316035_3.htm (accessed April 16, 2013). Others include Regulations on the Employment of Persons with Disabilities (残疾人就业条例), adopted by the State Council on February 25, 2007, which came into force on May 1, 2007; and Regulations on Barrier-Free Construction (无障碍环境建设条例), adopted by the State Council on June 13, 2012, which came into effect on August 1, 2012. The summit resulted in the “Beijing Declaration on the Rights of People with Disabilities in the New Century,” which called for the formulation of the Convention on the Rights of Persons with Disabilities (CRPD). CDPF, “Great humanitarian cause: the cause of people with disabilities in the past 50 years” (伟大的人道主义事业－－中国残疾人事业50年), July 23, 2002, http://www.cdpf.org.cn/lilun/content/2002-07/23/content_30316822.htmhttp://www.gov.cn/fwxx/cjr/content_1740464.htmMichael Ashley Stein, “China and Disability Rights,” Loyola of Los Angeles International and Comparative Law Review, vol. 33, no.7, 2010, p.12, http://digitalcommons.lmu.edu/ilr/vol33/iss1/2. Stein, “China and Disability Rights,” p.20. CDPF, “Constitution of the CDPF” (中国残疾人联合会章程), undated http://www.cdpf.org.cn/clgk/content/2011-04/13/content_30318400.htm (accessed June 6, 2013). CDPF, “Education” (教育), undated, http://www.cdpf.org.cn/jiaoy/jy.htm April 23, 2013). The People’s Republic of China, “Implementation of the Convention on the Rights of Persons with Disabilities: Initial reports submitted by States Parties under article 35,” February 8, 2011, paragraphs 96 and 146. Paul Mooney, “In the shadows,” South China Morning Post, August 15, 2012; Human Rights Watch interview with CDPF staff member and disability rights advocate, Guangdong Province, February 2013; Human Rights Watch interview with NGO member who works closely with the CDPF, Guangdong Province, February 2013. These two organizations provide legal consultation, legal aid, litigation, and research for people with disabilities and focus on education, employment, and accessibility issues. For a discussion about freedom of association in China, see Chinese Human Rights Defenders, “Reining in Civil Society: The Chinese government’s use of laws and regulations to persecute freedom of association,” August 7, 2009, http://www.chrdnet.com/2009/08/reining-in-civil-society-the-chinese-governments-use-of-laws-and-regulations-to-persecute-freedom-of-association/ For reports of harassment for disability organizations, see, for example, Aizhixing, “A Forum on the Registration of and Tax Payment for Non-government Organizations; Call for Strengthened Contact between NGOs” (非政府组织注册和纳税问题研讨会召开，呼吁加强非政府组织之间的联系), September 20, 2009, http://chinarightsgroup.blogspot.hk/2008/09/1077.html; “Yirenping Volunteers Hold Anti-Discrimination Demonstration, Are Taken Away by Police” (益仁平志愿者举行反歧视表演被警方带走), August 10, 2010, http://news.boxun.com/news/gb/china/2010/08/201008101602.shtml. For a discussion about the Chinese government’s co-optation of civil society organizations and making them align with government policies, see Andreas Fulda, “Government procurement of CSO services in the PR China: Doing the party’s work?” China Policy Institute Policy Paper, no. 4, 2013, http://www.nottingham.ac.uk/cpi/documents/policy-papers/cpi-policy-paper-2013-no-4-dr-andreas-fulda-government-procurement-of-cso-services-in-the-prc.pdf. Compulsory Education Law of the People’s Republic of China (中华人民共和国义务教育法, CEL), adopted in 1986 and amended by the National People’s Congress on June 29, 2006, and effective since September 1, 2006, art. 11. Wen Wang and Zhirong Jerry Zhao, “Public Budgeting and Financial Management Development in China' Symposium,” Journal of Public Budgeting, Accounting & Financial Management, May 17, 2010, http://ssrn.com/abstract=1669908 (accessed June 3, 2013). There is a third system — home-based teaching (or “sending teachers to [students’] homes” programs) — but it serves only small numbers of students and is not addressed in this report. Ministry of Education, “2011 National Education Development Statistics Bulletin” (2011年全国教育事业发展统计公报), http://www.moe.edu.cn/publicfiles/business/htmlfiles/moe/moe_633/201208/141305.html (accessed April 24, 2013). According to this annual bulletin, 398,700 students with disabilities attended special education schools while 225,200 of them attended mainstream school in 2011. However, the Chinese government stated in its state report to the Committee on the Rights of Persons with Disabilities in 2010 that 159,000 students studied in special education schools while 269,000 students attended mainstream schools. The discrepancy between Ministry of Education’s annual educational statistics bulletin and the state party report figures are great, with one suggesting students with disabilities are mostly in mainstream schools, the other suggesting the opposite. Here we have used the statistics from Ministry of Education for two reasons. First, all schools report to Ministry of Education about the number of students with disabilities and its figures are more likely to provide an accurate count. Second, Ministry of Education’s annual statistical bulletin has provided figures on students with disabilities since 1988, providing a bigger dataset to work with. We remain concerned about the discrepancies in data from these two sources, however; the discrepancies suggest caution is in order in interpreting any statistical information regarding students with disabilities in China. The figure, 28 percent (or more precisely, 27.9 percent), comes from the CDPF, “2011 annual national disability status and well-off process monitoring report” (2011年度全国残疾人状况及小康进程监测报告), September 13, 2012, p.10, https://www.google.com/url?sa=t&rct=j&q=&esrc=s&source=web&cd=2&cad=rja&ved=0CDkQFjAB&url=http%3A%2F%2Fwww.cdpf.org.cn%2Flilun%2Fcontent%2Fsite281%2F20120927%2F0023ae64b1ad11ce389605.doc&ei=2GidUeHnCPCSiQe58YDYDA&usg=AFQjCNEFhu5TGleuxyu_11B2nx7PuxWEUQ&sig2=2w_aXNrK2tgj7GMaQlolZg (accessed May 23, 2013). However, the percentage becomes 17 percent if using the following official figures: : the number of children out of school (126,000, data available from the CDPF) and the number of children with disabilities in school (398,700 in special education schools plus 225,200 in mainstream schools, data available from Ministry of Education). Calculations: 126,000/(126,000+398,700+225,200)x100%=16.8%.As discussed in footnote 25, the different official statistics for the number of students in mainstream schools and those in special education schools also seriously contradict each other. CDPF, “2001 National Disabled People Development Statistics Bulletin” (2011年中国残疾人事业发展统计公报), http://www.gov.cn/fwxx/cjr/content_2104842.htm (accessed April 24, 2013); Ministry of Education, “2011 National Education Development Statistics Bulletin” (2011年全国教育事业发展统计公报), http://www.moe.edu.cn/publicfiles/business/htmlfiles/moe/moe_633/201208/141305.html (accessed April 24, 2013). Ministry of Education and Other Departments, “Notice on Further Accelerating the Development of Special Education,” forwarded by the General Office of the State Council (国务院办公厅转发教育部等部门关于进一步加快特殊教育事业发展意见的通知), forwarded by the State Council on May 7, 2009, paragraph 1; and “Notice on Poverty Relief Program on People with Disabilities in Rural Areas (2011-2020)” (农村残疾人扶贫开发纲要（2011-2020年）), issued by the State Council January 3, 2012, Chapter 4 paragraph 4. As one World Bank study points out, “disability is associated with long-run poverty in the sense that children with disabilities are less likely to acquire the human capital that will allow them to earn higher incomes.” Deon Filmer, “Disability, Poverty and Schooling in Developing Countries: Results from 11 Household Surveys,” World Bank, November 2005, http://siteresources.worldbank.org/SOCIALPROTECTION/Resources/SP-Discussion-papers/Disability-DP/0539.pdf (accessed June 24, 2013). Sebastian Buckup, “The price of exclusion: The economic consequences of excluding people with disabilities from the world of work,” International Labor Organization. http://www.ilo.org/wcmsp5/groups/public/---ed_emp/---ifp_skills/documents/publication/wcms_119305.pdf (accessed April 16, 2013). CRC, art. 28; The International Covenant on Economic, Social and Cultural Rights (ICESCR), art. 13(2)(a)-(d). Two such recent regulations are: Ministry of Education and Other Departments, “Notice on Further Accelerating the Development of Special Education,” forwarded by the General Office of the State Council” (国务院办公厅转发教育部等部门关于进一步加快特殊教育事业发展意见的通知), forwarded by the State Council on May 7, 2009; and Ministry of Education, “Methods for Managing the ‘Study Along with the Class’ Scheme for Persons with Disabilities” (残疾人随班就读工作管理办法, MMSACS), issued in April 2011.
and Long-term Education Reform and Development” (国家中长期教育改革和发展规划纲要(2010-2020年)), issued on July 29, 2010; Disabled Persons' Work Committee of the State Council, “The Twelve Five Year Plan Outline on Disabled in China” (中国残疾人事业“十二五”发展纲要), issued on May 16, 2011. CRPD, arts. 4(1e) & 24(1 &5). Stein, “China and Disability Rights,” pp. 21-22. While anti-discrimination activists in the past decade have won a number of court cases, their legal arguments tended to focus on aspects of the law other than discrimination because it is difficult to prove discrimination in Chinese law. Committee on the Rights of the Child, “Report on the sixteenth session (CRC/C/69),” November 26, 1997, http://tb.ohchr.org/default.aspx?ConvType=20&docType=36 (accessed May 26, 2013). Enabling Education Network, “Report to Norad on desk review of inclusive education policies and plans in Nepal, Tanzania, Vietnam and Zambia,” November 2007, http://www.eenet.org.uk/resources/docs/Policy_review_for_NORAD.pdf (accessed May 17, 2013), p. 9. Save the Children, “Making Schools Inclusive,” 2008, http://www.savethechildren.org.uk/en/docs/making-schools-inclusive.pdf (accessed May 5, 2013), p. 10. UNESCO, “Guidelines for Inclusion: ensuring access to education for all,” 2005, http://unesdoc.unesco.org/images/0014/001402/140224e.pdf (accessed May 5, 2013). UNICEF, “The Right of Children with Disabilities to Education: A Rights-based Approach to Inclusive Education,” 2012, http://www.unicef.org/ceecis/IEPositionPaper_ENGLISH.pdf (accessed May 5, 2013), p.8. UNESCO, “Inclusive Education,” 2011, http://www.unesco.org/new/en/education/themes/strengthening-education-systems/inclusive-education/ (accessed June 6, 2013). Inclusion International, “Better Education for All: A Global Report,” October 2009, http://inclusion-international.org.cluster.cwcs.co.uk/wp-content/uploads/Better-Education-for-All_Global-Report_October-2009.pdf (accessed June 6, 2013). Specialized classes within mainstream schools, such as to provide Braille training or physiotherapy, may be beneficial for students with disabilities if the special classes complement or facilitate their participation in mainstream classes. UNICEF, “The Right of Children with Disabilities to Education: A Rights-based Approach to Inclusive Education,” 2012, http://www.unicef.org/ceecis/IEPositionPaper_ENGLISH.pdf (accessed May 5, 2013), p.16. According to the Chinese government, special education schools act as the “backbone” of education for these children, while regular schools are the “mainstream” suggesting that the two systems are equally important. Chinese government report to the Committee on CRPD. Para. 64. CEL, art. 19 and REPD, art. 21. Committee on the Rights of Persons with Disabilities, “Concluding observations on the initial report of China, adopted by the Committee at its eighth session (17–28 September 2012),” October 15, 2012, para. 36. Pang Xiaguang, “Mainstreaming children with disabilities: present and future development proposals in China” (中国残疾儿童随班就读现状和未来发展建议), A Journal of Modern Special Education, vol. 9, 2012, doi:10.3969/j.issn.1004-8014.2012.09.006. Proposed amendments to the Regulations on the Education of Persons with Disabilities (REPD), art. 23. Proposed amendments to the REPD, art. 4. Proposed amendments to the REPD, art. 14. University of Iowa, Office of Equal Opportunity and Diversity, “Assisting Students with Disabilities: A Guide to Instructors,” 2004, http://www.uiowa.edu/~eod/education/publications/assisting-students.html (accessed June 18, 2011). University of Iowa, Office of Equal Opportunity and Diversity, “Assisting Students with Disabilities: A Guide to Instructors,” 2004, http://diversity.uiowa.edu/eod/assisting-students-disabilities-guide-instructors (accessed April 11, 2013); Roger H. Martin, “ABC’s of Accommodations,” The New York Times, October 30, 2012, http://www.nytimes.com/2012/11/04/education/edlife/guide-to-accommodations-for-college-students-with-disabilities.html (accessed April 11, 2013); Special Education Support Service, Department of Education and Skills, Government of Ireland, “ What is Reasonable Accommodation in relation to examinations run by the State Examinations Commission?,” 2007, http://www.sess.ie/faq/what-reasonable-accommodation-relation-examinations-run-state-examinations-commission (accessed May 30, 2013). MMSACS, arts. 12, 20 and 30. LPDP, art. 28; REPD, art. 41; MMSACS, arts. 25 and 26. REPD, art. 21; The Education Law, art. 38; CEL, art. 19. Regulations on Barrier-Free Construction, art. 1. Proposed amendments to the REPD, arts. 3 and 40. Human Rights Watch interview with mother of a 15-year-old boy with albinism, Shandong Province, January 2013. Human Rights Watch interview with mother of a 9-year-old boy who has ADHD and intellectual disability, Henan Province, January 2013. Human Rights Watch interview with grandmother of a 13-year-old boy with intellectual disability, Hunan Province, January 2013. Human Rights Watch interview with mother of an 18-year-old man with intellectual disabilities, Fujian Province, December 2012. Human Rights Watch interview with mother of a 7-year-old who has a physical disability, Guangdong Province, December 2012. Human Rights Watch interview with mother of a 12-year-old boy with autism in Zhejiang Province, January 2013. Human Rights Watch interview with CDPF staff and disability advocate, Guangdong Province, February 2013. Human Rights Watch interview with disability advocate, Guangdong Province, February 2013. Human Rights Watch interview with mother of a 9-year-old boy who has a physical disability, Henan Province, January 2013. Human Rights Watch interview with the grandmother of a 13-year-old boy who has intellectual disability, Hunan Province, January 2013. Human Rights Watch interview with mother of an 11-year-old boy with autism, Shandong Province, January 2013. Human Rights Watch interview with an 8-year-old boy with hearing impairments, Guangdong Province, February 2013. Human Rights Watch interview with a 15-year-old girl with an intellectual disability, Jiangsu Province, January 2013. Human Rights Watch interview with a 16-year-old girl with an intellectual disability, Jiangsu Province, January 2013. Human Rights Watch interview with the grandmother of a 15-year-old girl with multiple disabilities, Guangdong Province, December 2012; Human Rights Watch interview with a mother of an 8-year-old boy who has multiple disabilities, Guangdong Province, December 2012; Human Rights Watch interview with a 16-year-old girl with an intellectual disability, Jiangsu Province, January 2013; Human Rights Watch interview with a 19-year-old woman with a physical disability, Henan Province, December 2012. Human Rights Watch interview with a 22-year-old woman with a hearing disability, Sichuan Province, January 2013. Human Rights Watch interview with parents of a 16-year-old girl who has an intellectual disability, Guangdong Province, December 2012. Human Rights Watch interview with a mother of a 15-year-old girl who has multiple disabilities, Guangdong Province, December 2012. Human Rights Watch interview with a mother of an 8-year-old boy who has multiple disabilities, Guangdong Province, December 2012. Human Rights Watch interview with mother of a 14-year-old girl with hearing impairments, Hubei Province, December 2013; Human Rights Watch interview with the mother of a 15-year-old girl with hearing impairments, Jiangxi Province, January 2013; Human Rights Watch interview with mother of a 16-year-old girl with a hearing disability, Gansu Province, January 2013; Human Rights Watch interview with mother of a 9-year-old with a physical disability, Guangdong Province, February 2013. Human Rights Watch interview with mother of a 16-year-old girl with hearing impairments, Gansu Province, January 2013. Human Rights Watch interview with mother of a 15-year-old with hearing impairments, Gansu Province, January 2013. Human Rights Watch telephone interview with a scholar who studies inclusive education, April 2013. Human Rights Watch interview with mother of a 6-year-old boy who has multiple disabilities, Guangdong Province, December 2012; Human Rights Watch interview with mother of a 9-year-old boy who has a physical disability, January 2013; Human Rights Watch interview with mother of a 15-year-old girl with hearing impairments, Gangsu Province, January 2013; Human Rights Watch interview with an 8-year-old boy with hearing impairments, Guangdong Province, February 2013. Human Rights Watch interview with mother of a 9-year-old girl with cerebral palsy, Hubei Province, December 2012. Human Rights Watch interview with a teacher at a public primary school, Guangdong Province, December 2012. Human Rights Watch interview with mother of an 8-year-old boy with hearing impairments, February 2013. Human Rights Watch interview with mother of a 12-year-old girl with an intellectual disability, Gansu Province, January 2013. Human Rights Watch interview with the mother of a 15-year-old girl with hearing impairments, Jiangsu Province, January 2013. Zhu Mingjian, “Shaanxi Province’s reply to information disclosure request, page 5,” post to “Zhu Mingjian’s blog” (zhumingjian的博客), May 22, 2013, http://photo.blog.sina.com.cn/u/1612425422 (accessed May 24, 2013). Peng Xiaguang, “On the Challenges Facing China in the Promotion of Inclusive Education and Relevant Suggestions” (中国全面推进随班就读工作面临的挑战和政策建议), Chinese Journal of Special Education, vol. 11, 2011, July 4, 2011, doi: 10.3969/j.issn.1007-3728.2011.11.004. Wang Haiping, “An Investigation Report on the Implementation of Special Education Courses in General Normal Colleges and Universities” (普通师范院校特殊教育课程可设情况的调查), Chinese Journal of Special Education, no. 12, 2006, http://file.lw23.com/d/d9/d99/d99f78c2-125f-4c12-aeed-e66bbe81b8de.pdf. Jian Yi, “The Current Status and Development Countermeasures: Study of Special Education at Compulsory Education Stage in Xinjiang Uygur Autonomous Region” (新疆维吾尔自治区义务教育阶段特殊教育现状与发展对策研究), master’s thesis, Xinjiang Normal University, January 28, 2010. CNKI (G769.2); Quan Lixia and Jiang Xiaoying, “An Investigation Report on Current Situation of the Development of Mainstreaming in China” (对我国随班就读发展现状评价的问卷调查报告), Chinese Journal of Special Education, no. 5, 2004; Hua Guodong, “Disabled Children’s Learning in Regular Class and the Development Trend of Such Practice” (残疾儿童随班就读现状及发展趋势), Educational Research, vol. 2, 2003. Human Rights Watch interview with a public primary school principal, Guangdong Province, December 2012. MMSACS, arts. 31 and 32. Wang Zhu, Yang Xijie and Zhang Chong, “A Survey on Factors Affecting the Quality of Mainstreaming Children with disabilities” (残疾儿童随班就读质量影响因素的调查), Chinese Journal of Special Education (Monthly), no.5, 2006. Human Rights Watch interviews with two primary school principals, Guangdong Province, December 2012. State Education Commission (predecessor of the Ministry of Education), “Methods for Implementing the Pilot Scheme of Mainstreaming Children and Young People with Disabilities” (关于开展残疾儿童少年随班就读工作的试行办法), July 21, 1994, art. 24. Human Rights Watch interview with mother of a 14-year-old boy who has cerebral palsy, Fujian Province, December 2012. A total of 16 bureaus of education responded (by May 1, 2013) to a government information disclosure request to 31 provincial and municipal bureaus of education filed by a disability activist. “Disability activist Zhu Mingjian sends letters to 31 education bureaus requesting disclosure of information regarding the education of children with disabilities” (残障公益人士朱明建：致信31省教育厅要求公开残疾儿童教育信息), Nanfang Daily, February 1, 2013, http://epaper.nfdaily.cn/html/2013-02/01/content_7164787.htm (accessed May 24, 2013). The bureaus’ replies are available on the activist’s blog, Zhu Mingjian, “Latest photos,” post to “Zhu Mingjian’s blog” (zhumingjian的博客), May 22, 2013, http://photo.blog.sina.com.cn/u/1612425422 (accessed May 24, 2013). See, for example, “Twin sisters ill with disease but insist on crawling to school for four years” (双胞胎姐妹患病坚持爬行上学4年), June 17, 2009, http://news.sina.com.cn/s/p/2009-06-17/132918038163.shtml. Medium Level of Economic Development,” http://www.bnu1.org/uploads/soft/1_110601085027.pdf (accessed on April 10, 2013). Human Rights Watch interview with mother of a 12-year-old girl with multiple disabilities, Guangdong Province, December 2012. Human Rights Watch interview with father of a 12-year-old girl with an intellectual disability, Guangdong Province, December 2012. Human Rights Watch interview with the grandmother of a 13-year-old girl with multiple disabilities, Guangdong Province, December 2012. Human Rights Watch interview with the mother of a 9-year-old girl with cerebral palsy, Hubei Province, December 2012. Of the 16 bureaus of education which responded (by May 1, 2013) to a government information disclosure request to 31 provincial and municipal bureaus of education submitted by a disability activist, only three provided direct answer to a question about the provision of visual aids, Braille and large print materials in schools. None of them said they provided such materials. “Disability activist Zhu Mingjian sends letters to 31 education bureaus requesting disclosure of information regarding the education of children with disabilities” (残障公益人士朱明建：致信31省教育厅要求公开残疾儿童教育信息), Nanfang Daily, February 1, 2013, http://epaper.nfdaily.cn/html/2013-02/01/content_7164787.htm (accessed May 24, 2013). The bureaus’ replies are available on the activist’s blog, Zhu Mingjian, “Latest photos,” post to “Zhu Mingjian’s blog” (zhumingjian的博客), May 22, 2013, http://photo.blog.sina.com.cn/u/1612425422 (accessed May 24, 2013). “Blind Students Have No Access to Ordinary Gaokao” (盲生无缘普通高考), Qingdao News, June 6, 2012, http://epaper.qingdaonews.com/html/qdzb/20120606/qdzb429798.html. Regulation on the Construction of Barrier-Free Environments, art. 20. “Disability activist Zhu Mingjian sends letters to 31 education bureaus requesting disclosure of information regarding the education of children with disabilities” (残障公益人士朱明建：致信31省教育厅要求公开残疾儿童教育信息), Nanfang Daily, February 1, 2013, http://epaper.nfdaily.cn/html/2013-02/01/content_7164787.htm (accessed May 24, 2013). The bureaus’ replies are available on the activist’s blog, Zhu Mingjian, “Latest photos,” post to “Zhu Mingjian’s blog” (zhumingjian的博客), May 22, 2013, http://photo.blog.sina.com.cn/u/1612425422 (accessed May 24, 2013). “Blind Beijing girl rejected twice for applying to sit self-study examinations, writes to education authorities to seek justice” (北京盲人女孩两次报名自考遭拒致信教委讨公平) Beijing News, September 29, 2011, http://www.haiyang2012.cn/List.asp?ID=4038 (accessed September 5, 2013). “Blind woman stands out and wins moderator contest, was made an exception in qualifying for tertiary level self-study examinations” (盲人从主持人大赛脱颖而出破格获高自考资格), Beijing People’s Broadcasting Station, July 24, 2012, http://news.rbc.cn/baixing/daily/201207/t20120724_2725158.htm (accessed April 29, 2013). Human Rights Watch interview with mother of a 15-year-old with a hearing impairment, Gansu Province, January 2013; Human Rights Watch interview with a 16-year-old girl with hearing impairments in Gansu Province, January 2013; Human Rights Watch interview with a 14-year-old girl with hearing impairments in Hubei Province, December 2013; Human Rights Watch interview with a 22-year-old woman with hearing impairments in Sichuan Province, March 2013; Human Rights Watch interview with disability advocate, Guangdong Province, February 2013.; Human Rights Watch interview with CDPF staff and disability advocate, Guangdong Province, February 2013. Human Rights Watch interview with mother of an 8-year-old with multiple disabilities in Guangdong Province, December 2012; Human Rights Watch interview with a 16-year-old girl with hearing impairments in Gansu Province, January 2013; Human Rights Watch interview with CDPF staff and disability advocate, Guangdong Province, February 2013. Human Rights Watch interview with a 22-year-old woman with hearing impairments in Sichuan Province, March 2013. Human Rights Watch interview with a 14-year-old boy with cerebral palsy, Hunan Province, January 2013; Human Rights Watch interview with mother of an 11-year-old boy with autism, Shandong Province, January 2013. Human Rights Watch interview with mother of a 15-year-old girl with a hearing impairment, Gansu Province, January 2013. Wang Qiang, “Deaf students passed College English Test level 4” (聋人大学生拿下英语四级), Tianjin Daily Metro Express, June 15, 2007, http://epaper.tianjinwe.com/cskb/cskb/2007-06/15/content_789346.htm (accessed April 29, 2013). Human Rights Watch interview with a 22-year-old woman with hearing impairments, Sichuan Province, March 2013. Human Rights Watch interview with a 17-year-old girl with a physical disability, Henan Province, December 2012. Human Rights Watch interview with mother of a 15-year-old girl with hearing impairments, Gansu Province, January 2013. Human Rights Watch interview with mother of a 15-year-old girl with multiple disabilities, Guangdong Province, December 2012. Human Rights Watch interview with mother of a 9-year-old boy who is deaf-mute, Hunan Province, January 2013. UNESCO, “Inclusive Education on the Agenda,” paper prepared for the World Bank, Human Development Week, March 4-6, 1998. “Exceptional circumstances can be treated as special cases in college entrance physical examinations, eight point reminders for the examinations” (高考体检特殊情况可特殊处理提醒体检八项注意), Beijing Evening Post, February 28, 2008, http://news.xinhuanet.com/edu/2008-02/28/content_7686815.htm (accessed May 7, 2013). Ministry of Education, Ministry of Health and CDPF, “Guiding Opinion on Physical Examinations in the Recruitment of Students in Ordinary Higher Education Institutions” ( 普通高等学校招生体检工作指导意见), issued on March 3, 2003. “Notice from Ministry of Education, Ministry of Health and the CDPF” (三部委通知), issued on March 3, 2003; Ministry of Education, Ministry of Health and the CDPF, “Guiding Opinion on Physical Examinations in the Recruitment of Students in Ordinary Higher Education Institutions” (普通高等学校招生体检工作指导意见), issued on March 3, 2003. Human Rights Watch telephone interview with a 26-year-old man who has albinism, May 2013. In past years, a number of press reports have revealed that several students with disabilities were rejected by universities for failure to report their disabilities. In all these cases, the students countered that it was the doctors and the administrators of the test that made the mistake. See Li Kang, “University deny enrollment to disabled candidate after hospital made a mistake in inputting data in the candidate’s physical examinations record” (医院把体检信息输错残疾高考生遭大学拒录), Dahe Post, September 9, 2010, http://www.tesoon.com/a_new/htm/08/36634.htm (accessed April 3, 2013); “Controversy over the cancelling of qualifications of a disabled candidate suspected in physical examinations reporting fraud” (体检表被疑造假残疾考生入学资格被取消惹争议), Legal Daily, September 13, 2009, http://news.xinhuanet.com/edu/2007-09/13/content_6714858.htm (accessed April 3, 2013); Meng Dengke, “Can a Disabled Boy Study in Sichuan University? Disabled boy accused of ‘hiding the truth’ in filing physical examinations form” (残疾男孩能否入读川大？), Nanfang Weekend, October 5, 2006, http://www.southcn.com/weekend/commend/200610050006.htm (accessed April 3, 2013); Liu Yingcai, “Female college students with disabilities forced to drop out: Zhu Huijin’s fruitless negotiations with the county government” (残疾女大学生被迫退学续:朱慧锦与县政府交涉无果), Beijing Post, December 23, 2004; http://news.xinhuanet.com/newscenter/2004-12/23/content_2370047.htm (accessed April 3, 2013); Wang Fangjie and Li Runmei, “Top student forced to drop out after being admitted to university because of his disabilities, student says he will fight for his right to education” (成绩优异考上大学因残疾被退学学生讨要学习权), Xinhua, September 27, 2004, http://www.cq.xinhuanet.com/news/2004-09/27/content_2943018.htm (accessed April 3, 2013). “Admission criteria for higher education institutions are shockingly discriminatory” (高校招生自造“歧视门”规定一条比一条雷人), Beijing Evening Post, August 1, 2009, http://edu.163.com/09/0801/22/5FLPH71200293HCU.html. After news reports exposed the university’s admission criteria in 2009, the university’s subsequent enrollment webpages have not mentioned criteria for denying admission to persons with disabilities. “Capital University of Economics and Business Huaqiao College Student Enrollment and Recruitment: FAQ” (2011年招生问题解答), Capital University of Economics and Business, http://www.cueb-occ.com/zhaoshengpd/wtjd.html (accessed April 2, 2013). “Physical Examination Supplementary Regulations of Jimei University” (集美大学招生体检补充规定), Jimei University, http://gkcx.eol.cn/schoolhtm/physicalExaminationStandard/physicalExaminationStandard471.htm (accessed February 18 2013). Websites which contain higher education news and advise often contain such recommendations. See, for example, Zhao Li, “Do not ignore application tactics in higher education physical examinations” (高招体检不要忽视报考建议), April 3, 2012, Chutianjin Post, http://www.huaue.com/zytb/20124395138.htm. Human Rights Watch telephone interview with a 26-year-old woman who has a physical disability, May 2013. CRPD, arts 24(4), 27(a) and (i). Ministry of Education, “Teachers Qualification Regulations” (教师资格条例), effective since September 23, 2000, http://www.cdpxedu.gov.cn/detail-6628.aspx (accessed April 12, 2013). See Zheng Xiaoqian and Shi Caiying, “At least 20 provinces and municipalities allegedly discriminate against people with disabilities in teacher qualifications medical standards” (至少20个省市教师资格体检标准涉嫌歧视残疾人), Henan Shangbao, September 10, 2011, http://www.ce.cn/xwzx/gnsz/gdxw/201109/10/t20110910_22686541.shtml (accessed February 7, 2013). Shaanxi Provincial Bureau of Education, “Standards and methods used in the physical examinations for teacher qualifications in Anhui province” (陕西省申请教师资格人员体检标准及办法（试行）), http://www.xaks.com.cn/2809.html, (accessed April 12, 2013). “One-armed teacher ‘finds it difficult to be eligible for teachers’ qualifications, physical examinations standards discriminate against persons with disabilities” (“独臂老师”难迈资格门槛体检标准歧视残疾人), Xinan Wanbao, February 24, 2010, http://learning.sohu.com/20100224/n270395025.shtml (accessed April 12, 2013). Ministry of Education, "2011 National Education Development Statistics Bulletin” (2011年全国教育事业发展统计公报), http://www.moe.edu.cn/publicfiles/business/htmlfiles/moe/moe_633/201208/141305.html (accessed April 24, 2013). International Disability Alliance, “Recommendations on China CRPD Committee 8th Session from September 17-28, 2012,” http://www.ohchr.org/EN/HRBodies/CRPD/Pages/Session8.aspx (accessed May 9, 2013). Ministry of Education, “2011 National Education Development Statistics Bulletin” (2011年全国教育事业发展统计公报), http://www.moe.edu.cn/publicfiles/business/htmlfiles/moe/moe_633/201208/141305.html (accessed April 24, 2013). Human Rights Watch interview with mother of a 9-year-old girl with cerebral palsy, Hubei Province, December 2012; Human Rights Watch interview with a 27-year-old man with visual impairments, Anhui Province, April 2013; Human Rights Watch interview with CDPF staff and disability advocate, Guangdong Province, February 2013; Human Rights Watch telephone interview with a teacher at a special education school in Shandong Province, April 2013. Human Rights Watch interview with mother of a 10-year-old girl with an intellectual disability, Guangdong Province, December 2012. Human Rights Watch telephone interview with a teacher at a special education school in Shandong Province, April 2013. Human Rights Watch interview with a 27-year-old man with visual impairments, Anhui Province, April 2013. Huang Nianchun, “Improving quality: the important issues special education schools are facing in the new century” (提高质量: 新世纪特教学校面临的重要课题), Modern Education Forum, vol.6, 2008; Liu Quanli and Wang Hui, “The four problems with China’s special education” (中国特殊教育中的四个问题), China Special Education, vol.5, 2006; Guo Chunning, “Special education should be the priority area in its provision of national basic public education” (特殊教育应是国家基本公共教育服务优先保障的领域), China Special Education, vol. 5, 2011. Qu Xueli, “Higher vocational education is an important way for the development of the cause for the disabled” (高等职业教育是发展残疾人事业的重要途径), China Special Education, vol. 3, 2001. Diao Chunhao, “Vocational education for people with disabilities: Achievements, problems and countermeasures” (残疾人高等职业教育：成就、问题已对策), Continuing Education Studies, vol. 3, 2011; Guan Caijun, “Some thoughts on developing higher vocational education under the new situation” (新形势下发展残疾人高等职业教育的几点思考), Culture of Education Forum, vol. 6, 2011. Human Rights Watch interview with a 15-year-old boy with visual impairments, Shandong Province, January 2013. Ni Zhen, “Untapped Talent,” China Vision, forthcoming 2013. Special Education College for Changchun University, “College Homepage: Introduction” (学院首页: 学院简介), http://cdtjxy.ccu.edu.cn/about.asp?actionid=166 (accessed March 26, 2013). Human Rights Watch interview with grandmother of a 12-year-old boy with cerebral palsy, Guangdong Province, December 2012. Human Rights Watch interview with father of a 14-year-old girl with cerebral palsy, Fujian Province, December 2012. Human Rights Watch interview with the grandmother of a 13-year old girl with multiple disabilities, Guangdong Province, December 2012. Human Rights Watch interview with a 14-year-old girl with hearing impairments, Hubei Province, December 2012; Human Rights Watch interview with a 14-year-old boy with a physical disability, Hunan Province, January 2013. Human Rights Watch interview with the mother of a 15-year-old girl with hearing impairments, Jiangxi Province, January 2013. Human Rights Watch interview with mother of a 9-year-old boy who is deaf and has speech impairments, Hunan Province, January 2013. Human Rights Watch telephone interview with former staff member at an international disability organization with programs in China, March 2012. Human Rights Watch interview with CDPF staff member, Guangdong Province, February 2013. Human Rights Watch interview with mother of a 9-year-old with attention-deficit/hyperactivity disorder (ADHD) and an intellectual disability, Henan Province, January 2013. Human Rights Watch interview with a 14-year-old boy who has cerebral palsy, Fujian Province, December 2012. 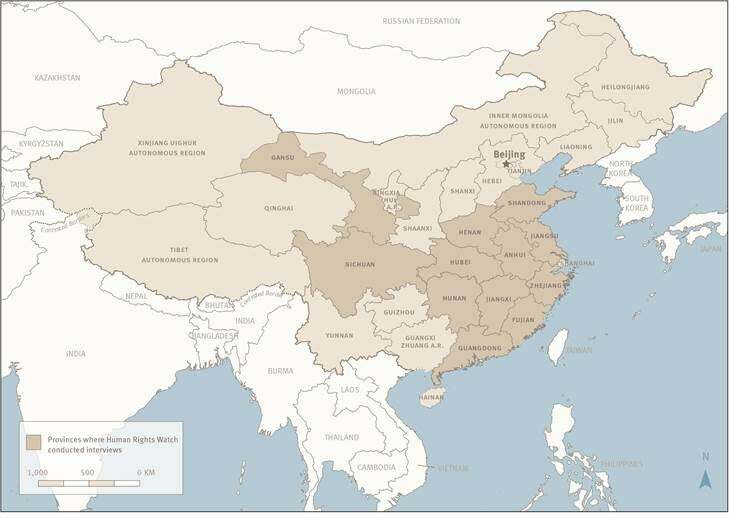 The Bureaus of Education that responded were Tibet Autonomous Region, Jiangsu Province, Anhui Province, Gansu Province, and Xinjiang Uyghur Autonomous Region. “Disability activist Zhu Mingjian sends letters to 31 education bureaus requesting disclosure of information regarding the education of children with disabilities” (残障公益人士朱明建：致信31省教育厅要求公开残疾儿童教育信息), Nanfang Daily, February 1, 2013, http://epaper.nfdaily.cn/html/2013-02/01/content_7164787.htm (accessed May 24, 2013). The bureaus’ replies are available on the activist’s blog, Zhu Mingjian, “Latest photos,” post to “Zhu Mingjian’s blog” (zhumingjian的博客), May 22, 2013, http://photo.blog.sina.com.cn/u/1612425422 (accessed May 24, 2013). Human Rights Watch interview with a 16-year-old girl with hearing impairments in Gansu Province, January 2013. Human Rights Watch interview with a 28-year-old man who has a physical disability, February 2013. Committee on the Rights of Persons with Disabilities, “Concluding observations on the initial report of China, adopted by the Committee at its eighth session,” October 15, 2012, http://www.ohchr.org/EN/HRBodies/CRPD/Pages/Session7.aspx (accessed April 15, 2013), Paragraphs 9 and 18.
 International Disability Alliance, “IDA proposals for the list of issues on China CRPD Committee 7th Session,” http://www.ohchr.org/EN/HRBodies/CRPD/Pages/Session7.aspx (accessed April 15, 2013). Committee on the Rights of Persons with Disabilities, “Concluding observations on the initial report of China, adopted by the Committee at its eighth session,” October 15, 2012, http://www.ohchr.org/EN/HRBodies/CRPD/Pages/Session7.aspx (accessed April 15, 2013), Paragraph 15. See, for example, Huaihua City Disabled Persons’ Federation, “The Yuanling County CDPF visited special education school teachers and students” (沅陵县残联走访慰问县特教学校师生), September 13, 2012, http://cl.huaihua.gov.cn/Article/ShowArticle.asp?ArticleID=754 (accessed April 30, 2013); Shandong Provincial Disabled Persons’ Federation, “Provincial CDPF work meeting convenes in Jinan” (全省残联工作会议在济南召开), December 31, 2012, http://www.sdcl.org.cn/contents/658/9384.html (accessed May 1, 2013). Committee on the Rights of Persons with Disabilities, “Concluding observations on the initial report of China, adopted by the Committee at its eighth session,” October 15, 2012, http://www.ohchr.org/EN/HRBodies/CRPD/Pages/Session7.aspx (accessed April 15, 2013), Paragraph 16. Of the 16 education bureaus which responded to the information request, only three (Tibetan Autonomous Region, Xinjiang Uyghur Autonomous Region and Anhui Province) responded directly the question regarding the amount of funding they spent on publicizing the educational right of children with disabilities. Two (Tibetan Autonomous Region and Anhui Province) did not give details of the amount spent. The Xinjiang bureau said it spent 15,000 renminbi (roughly US$2,440) on publicity but it did not explain what it has done. Nanfang Daily, “Disability activist Zhu Mingjian sends letters to 31 education bureaus requesting disclosure of information regarding the education of children with disabilities” (残障公益人士朱明建：致信31省教育厅要求公开残疾儿童教育信息), February 1, 2013, http://epaper.nfdaily.cn/html/2013-02/01/content_7164787.htm (accessed May 24, 2013). The bureaus’ replies are available on the activist’s blog, Zhu Mingjian, “Latest photos,” post to “Zhu Mingjian’s blog” (zhumingjian的博客), May 22, 2013, http://photo.blog.sina.com.cn/u/1612425422 (accessed May 24, 2013). CDPF, “The organizational structure of the CDPF: a Map” (中国残疾人联合会组织系统架构图), http://www.cdpf.org.cn/jgsz/jgsz.htm (accessed May 9, 2013). CDPF, “A summary of disability rights work in all provinces in 2007” (各省2007年残疾人维权工作总结), December 21, 2007, http://www.cdpf.org.cn/2008old/weiq/content/2007-11/21/content_76072_37.htm (accessed April 15, 2013). An Sui, “Beijing Special Needs Children Will Study Along with the Class in Ordinary Schools” (北京特教儿童将随班就读普通校), Qianlong.com, November 10, 2012, http://news.ifeng.com/mainland/detail_2012_11/10/19019215_0.shtml (accessed February 19, 2013). Zhu Mingjian, “Beijing’s reply to open information request , p. 4,” post to “Zhu Mingjian’s blog” (zhumingjian的博客), May 17, 2013, http://photo.blog.sina.com.cn/photo/601ba8cegdce5f01ae66e (accessed May 24, 2013). Wang Mei, “Problems and strategic solutions in the construction of resource rooms” (资源教室建设中的问题与解决策略), A Journal of Modern Special Education, vol. 12, 2008. Zhu Mingjian, “Xinjiang’s reply to open information request,” post to “Zhu Mingjian’s blog” (zhumingjian的博客), May 22, 2013, http://photo.blog.sina.com.cn/u/1612425422 (accessed May 24, 2013). World Bank, “Education for All: The Cost of Accessibility,” August 2005, http://www-wds.worldbank.org/external/default/WDSContentServer/WDSP/IB/2007/03/01/000310607_20070301144941/Rendered/PDF/388640EdNotes1August2005CostOfAccess12.pdf (accessed July 29, 2011). “Students with Disabilities Study Along with the Class without Barriers in Chaoyang District” (朝阳区残疾学生随班就读“无障碍”), Beijing Daily, June 25, 2009, http://news.163.com/09/0625/13/5CLHRLAF000120GR.html (accessed February 19, 2013). UNESCO, "Policy Guidelines on Inclusion in Education,” 2009, http://unesdoc.unesco.org/images/0017/001778/177849e.pdf (accessed June 3, 2013), p. 9; Samuel L. Odom, Thomas B. Parrish, and Christine Hikido, “The Costs of Inclusive and Traditional Special Education Preschool Services,” Journal of Special Education Leadership, vol. 14, no. 1, 2001, pp. 33-41; Bob MacMillan, Michael Grimes, Bill Filler, Christie Norton, Nancy Cooper, Teresa Gibson, “Cost Effectiveness of Maintaining Students with Emotional Disorders in the Public School System,” Education Resources Information Center (ED411656), September 10, 1997, http://www.eric.ed.gov/ERICWebPortal/detail?accno=ED411656; Margaret J. McLaughlin and Sandra Hopfengardner Warren, “The Costs of Inclusion,” School Administrator, vol. 51, no. 10, Nov. 1994, pp. 8-12,16-19. Mayo Clinic, “Attention-deficit/hyperactivity disorder (ADHD) in children,” http://www.mayoclinic.com/health/adhd/DS00275 (accessed May 1, 2013). WebMd, “ADD & ADHD Health Center,” http://www.webmd.com/add-adhd/default.htm (accessed May 1, 2013). Autism Speaks, “What Is Autism?” http://www.autismspeaks.org/what-autism (accessed April 16, 2013). The American Heritage® Stedman's Medical Diction, 2002, http://dictionary.reference.com/browse/Cerebral+Palsy (accessed April 16, 2013).